This page contains a series of articles that attempt to cover the major physical, biological and psychological factors involved in running. The first of these was an introduction and overview posted on 18th March 2008. As each new article in the series is posted on the blog, it will be appended so as to provide a single continuous record of the series. This series updates and extends the page entitled ‘Mechanics of Efficient Running’ published in January 2008. That page remains on this site, but a few of the ideas expressed on that page have been modified by my subsequent thoughts and discussions. Furthermore, this page was edited in April 2012 to take account of the results on computations performed as a result of my discussion with Robert Osfield over the New Year period, 2011-2012 (reported in the comments section below). The results of these computations were presented and discussed in several blog postings in the period January to April 2012. The essence of running is becoming airborne. When a human wants to increase speed while walking, he or she can increase stride rate or stride length. Beyond a certain stride rate, muscle contraction becomes inefficient because force is generated by a ratchet-like interaction between actin and myosin molecules within the muscle fibre, and the speed of this ratchet action is limited by the time it takes to make and break chemical bonds. Furthermore, it can be shown that the energy cost of swinging the leg forward rises in proportion to the produce of velocity times cadence (at least while running and a similar effect would be anticipated during walking) so at high speed, the energy cost of a high cadence becomes large. Beyond a certain stride length, efficiency falls due to poor leverage of muscles on awkwardly angled legs. The oblique forward angle of the leg in the period immediately after footfall gives rise to a large braking force that slows the body while increasing risk of injury. So the only practical option for further increase in speed is to increase stride length by becoming airborne for part of each stride. Thus we make the transition from walking to running. Becoming airborne requires energy to propel us upwards against gravity. Once we are airborne, our body inevitably experiences a downwards acceleration of 9.8 metres/sec/sec (32 feet/sec/sec) due to gravity. The energy used to raise the body is now converted to kinetic energy that must be dissipated on impact with the ground. While a single impact following a fall of a few inches is unlikely to do much damage, minor impact repeated thousands of times creates a risk of repetitive strain injuries to connective tissue or even to stress fracture of bones such as the metatarsals in the feet or the tibia (shin bone). Thus, while running can be both graceful and efficient, it is also an energetic and risky form of locomotion. Not surprisingly, many runners suffer injury. Thus running is a dance with the devil – gravity. We spend energy raising ourselves against this demon and then are at risk of injury as we are flung back to earth. However, in the force of impact, there is the sniff of a deal with the devil. If instead of dissipating the impact energy destructively at foot-fall we can capture it as elastic potential energy by the stretching of muscles and other connective tissues, this elastic energy might subsequently be recovered to propel us upwards at lift-off. The muscle contraction energy required to lift our bodies is reduced and the jarring effect of impact is diminished. The process of capturing impact energy as elastic energy and sustaining it as we prepare for lift-off requires exquisitely controlled tensioning of muscles and angling of joints. Releasing it at the right moment and in the correct direction requires exquisite timing. Fortunately our brains learn to do this automatically in infancy and childhood, so for the most part, we can run tolerably well without thinking about it. However, whether due to bad habits of posture acquired sitting in an office chair, to de-conditioning of the muscles of the feet due to wearing shoes, or simply the fact that nothing in either the evolution of the species or the experiences of childhood prepared us for the monotonous repetitive impacts produced by running for miles on a paved surface, few people run naturally with optimum efficiency or adequate safety. Therefore, we need to learn how to run. This is the introduction to a series of three articles that will address the question of how to run efficiently and safely. In our dance with the devil both he and we are constrained by the laws of motion. We cannot violate these laws. If we try to we are likely to waste energy and/or injure ourselves. In this article we will examine the physical mechanics of running. We will identify the constraints imposed by the laws of Newtonian physics. These laws are immutable (at least for bodies of human scale moving at running speed) and therefore, they provide a clearly defined framework that must be taken into account irrespective of personal choice or opinion. The third section will deal with the psychodynamics of running: the intentions, beliefs and perceptions that allow us to perform the steps of the dance. It is impossible, and in any case counterproductive to try to consciously manage each muscle contraction when running. We can only attend consciously to a single perception at one time, so we need to identify the aspects of our running on which it is most helpful to focus consciously. Fortunately, as we shall see when we consider the constraints imposed by the laws of mechanics, the magnitude and direction of the impulses delivered at lift-off place tight constraints on the location and impact of footfall. Furthermore, we have well developed automatic mechanisms that regulate footfall. Therefore, most of our conscious focus should be on the lift-off. Perception is a product of sensory information entering the brain and of predictions generated within the brain. The predictions are shaped by prior beliefs. What we perceive does not necessarily correspond exactly with what an external observer or a video camera might record. We ourselves can shape our perceptions. Some schools of running technique, such as Pose (Pose Method of Running, Nicholas Romanov, Pose Tech Corp 2002) appear to encourage perceptions that are contrary to the laws of physics, and in particular encourage the perception that freely available propulsive energy is provided by gravity. The Pose Method provides many valuable insights into good running style. The perception that gravity provides freely available energy for propulsion might be beneficial insofar as it might discourage unnecessary and wasteful muscular effort, but in my opinion, it leads to internal contradiction and confusion in the mind of the runner. Therefore, the goal of this article is to develop perceptions that are consistent with the biomechanics of running based on physical laws and biodynamics. The conversion of intention into action is guided not only by perception but also by a more tenuous but crucial mental attribute: confidence. It is confidence that allows conscious perception to be integrated with automatic processes to produce the exquisite control of force and timing necessary to run well. One way to acquire confidence is to place faith in a guru. The other is to place faith in principles derived from understanding of the laws of physics and from sound biodynamic theory. The ambitious goal of this set of articles is to provide a foundation for such confidence. However, it should be emphasised that the material presented is a preliminary effort at assembling such principles. The main direct evidence supporting them is my own experience as a runner. I am not a coach. My experience should not be assumed to apply to others and before changing one’s running style it is advisable to consult a qualified coach. As discussed in the introduction, the essence of running is locomotion in which the length of stride is increased by becoming airborne for a part of each stride. In this article we will consider the constraints that the laws of Newtonian mechanics place on how we run. These laws apply whatever running style we adopt. The laws do not tell us which muscles we should use to achieve our goal, but they do provide guidance to help answer questions about optimum cadence and stride length and the relative proportion of each stride that should be spent airborne for optimum efficiency and safety. Before starting, we should define a few of the terms we will use. The full gait cycle covers the period from the time at which one foot contacts the ground (foot-fall) to the next time point at which that same foot contacts the ground. For ease of description, we will assume that this foot is the right foot. During the cycle, there are several phases. At first, the right foot remains stationary on stance while the torso passes forwards over it. Once the torso has passed over the point of support (usually located under the forefoot) which happens at mid-stance, the hip extends backwards until the point of lift-off is reached, initiating the swing phase for the right leg. The first airborne phase continues until foot fall of the left leg. While the left leg is on stance, the right leg continues to swing forwards. Shortly after the left leg lifts from the ground, the right leg reaches it forward most point of travel relative to the torso and then drops to the ground. At footfall of the right foot, the full cycle is completed. It contains one period of stance for each foot and two airborne phases. Note that the swing phase for one leg includes two airborne phases and also the period while the other leg is on stance. Stride length is the distance on the ground from where the right foot contacts the ground to the point where the left foot contacts the ground. Cadence is the number of strides per minute. (Note that some people define cadence as number of gait cycles per minute, giving numerical values half as large as the values we will quote.) Speed is obtained by multiplying stride length by cadence. For most runners, cadence is approximately constant through the much of their range of speeds, and is typically 180 strides per minute. At this cadence, a stride length of 1 metre corresponds to a speed of 180 metres per minute (which is a little slower than 1Km in 5 minutes or 1 mile in 8 minutes.) Speed can be increased at constant cadence by increasing stride length. At a cadence180, a stride length of 2.2 metres corresponds to 4 minute mile pace. We run more efficiently when we consume less energy per kilometre at a given speed. Efficiency can be quantified as the energy required to run a fixed distance at a particular speed. The higher the efficiency the lower the energy required. Safety refers to running with low risk of injury. In general, risk of injury increases with increasing magnitude of forces applied to body tissues, though factors such as the direction of application of force, and the rate at which forces are applied play a large part. Also, in light of the fact that running often involves thousands of repeated impacts, that it is important to note that repeated application of relatively small forces than are well below the level required to break a bone or tear a muscle can cause stress fractures of bones or repetitive strain injures to muscles and other connective tissues. Nonetheless, if our goal is running safety, in general we are aiming to minimise the size of forces exerted on body tissues and the abruptness with which they are applied. 3) Moving the legs forward to provide support on landing. Newton’s first law of motion a states that a body will continue in a state of uniform motion at constant velocity unless acted upon by a force. That is, the body maintains constant forward directed momentum unless acted upon by external forces. To influence forward momentum, these forces must have a component acting the either the forwards or backwards direction. Although gravity acts on each part of the body, for the purpose of estimating the overall effect of gravity on the body, the force of gravity can be treated as acting through the general centre of mass (gcm) of the body, which is also called the centre of Gravity (COG). Although the anatomical location of the gcm moves slightly within the body as the legs move relative to the torso, the COG is always in the vicinity of the midpoint of the line that joins the iliac crests (the prominent curved bony ridge above the hip and just below the waist level on each side of the body); it is the top edge of the side of the pelvis.) Because gravity act downwards, it cannot directly produce acceleration or deceleration of the body in a forwards or backwards direction. Thus, gravity does not directly produce any change in forward momentum. The vertical ground reaction force (vGRF) arises as a reaction by the ground to the downwards forces exerted by the body via the legs and feet on the ground. The downwards forces exerted by the body arise from the body’s weight; from active contraction of muscles pushing down; and from elastic recoil of stretched muscles and connective tissues. The upwards vGRF is due to elastic reaction by the ground as it resists compression by the body. Upwards ground reaction force is equal and opposite to the downwards force exerted by the body according to Newton’s third law. By virtue of acting vertically, vGRF cannot directly alter the forwards momentum of the body. When the legs are directed obliquely forwards and down as is the case in the early part of the stance phase, the ground reaction has a backward directed horizontal component (hbGRF) that exerts a braking effect on the body. The horizontal component of the force that the body exerts on the ground arises from muscle contraction pushing obliquely and/or from elastic recoil forces acting obliquely. The ground reaction force is generated by the resistance of the ground to compression by the pressure of the foot.. Similarly, when the legs are directed obliquely down and back as in the latter part of stance, the ground reaction generates a forward directed hfGRF, that tend to accelerate the body forwards. By convention, we regard the direction from front to back of the body as the direction of the y axis. Relative to this axis, hbGRF has positive values while hfGRF has negative values. When the foot is on the ground, it is assumed to be stationary. This implies that there is no friction force (the retarding force generated when one surface slides over another) though it can be helpful to consider that the vertical pressure of the foot on the ground generates a property called stiction holds the foot in place. This stiction is sometimes described as static friction but it does no work to either propel or retard the motion of the body. Figure 1 is a diagrammatic illustration of typical force plate data demonstrating the ground reaction forces along the y axis for a mid-foot runner. Because the foot must be angled inwards if the point of support is to be under the centre of mass, the foot exerts a sideways (x axis) force on the ground that elicits an opposing sideways ground reaction force, hxGRF. However, assuming symmetry, the sideways forces exerted by one foot exactly balance those exerted by the other foot so there is no net sideways impulse averaged over the full gait cycle. In any case, because it acts sideways, hx GRF cannot affect forwards momentum. Except when running with a strong following wind, wind resistance mainly acts in a backwards direction on the body and tend to produce deceleration. Movement of the body in the vertical direction and movement of the limbs will also generate air drag, but these forces are usually very small, and in any case, tend to be reversed and therefore to cancel out over the duration of the gait cycle. The other forces that act during running, naming the forces generated by muscle contraction, and the elastic recoil forces generated when muscles, tendon and ligaments are passively stretched, do not act on the body. Rather than act either within the body or they act on the ground thereby generating the GRF. Because they do not act on the body, they do not directly cause acceleration or deceleration of the body. If a force F acts for a time t, then it can readily be shown from Newton’s second law of motion (F=ma) that the force produces a change in momentum given by Ft. This product of force and time is known as the impulse delivered by the force. Backward directed forces are wind resistance and the backward component of ground reaction, hbGRF, which acts while the leg is directed obliquely forwards and down between footfall and the point at which the COG passes over the point of support. The only forward directed force is the forward directed component, hfGRF, which acts when the leg is directed obliquely down and back after the COG has passed over the point of support until lift-off. These considerations reveal two important principles. a) In the absence of wind resistance, the impulse due to backwards directed GRF must equal that due to forwards directed GRF. The period that the foot is on the ground before COG passes over the point of support must be approximately equal to the period after the COG passes over the point of support. If one lands with point of support directly under the COG, impulse due to hfGRF will not be balanced by a braking impulse, and the body will accelerate out of control. Thus, except in the presence of a substantial head wind, the advice to aim to land under the COG, commonly given by advocates of efficient running, is misleading. In fact, video recording of runners demonstrate that the foot does land in front of the COG even in individuals who aim to land under the COG. However, because of the different angles at the joints in early stance compared with late stance, vGRF rises more rapidly in early stance than the rate at which it decreases in late stance, to the period between mid-stance and lift off is usually appreciably longer than the period between footfall and mid-stance. b) In the presence of wind resistance, the drag due to the wind must be compensated for hfGRF which is a reaction to a downwards and backwards push by the leg on the ground. The push against the ground must be provide either by elastic recoil of muscles and connective tissues muscle releasing energy stored as elastic potential energy following the impact of footfall, or by active muscle contraction. When the long axis of the body is leaning forwards (i.e. when the COG is in front of the point of support) gravity acts obliquely relative to the axis of the body. Therefore, there is a component of gravity at a right angle to the long axis of body that can be considered to be acting on the COG. If the body is on stance with the foot fixed, the component of gravity at right angles to the body is will exert a torque that tends to cause the body to rotate in a face forwards and downwards direction. This situation exists during the latter half of the stance phase. However this torque does not directly facilitate forward propulsion. In fact, there is not even an increase in the speed of rotation of the body in a face-forward direction about the pivot at the point of support, on account of the opposite rotational effect of the upward vGRF acting during stance. To appreciate this point it is helpful to consider three hypothetical situations. If the torso passes over a pivot at the point of support at constant velocity, the line from point of support to COG rotates around the pivot point in a face-forwards direction. If a net downwards vertical force acts on the COG after it has passed over the point of support, the speed of face-forward rotation would be expected to increase as the downward acceleration adds to the speed of rotation. However, if a net upwards vertical force acts, the upward acceleration of the COG makes the line from point to support to COG more vertical and thereby slows the rate at which this line rotates in a face-forward direction. Throughout most of the stance period, the net vertical force is upward. The speed of face-forward rotation about the point of support slows after mid-stance. The proposal that gravitational torque might provide free energy that facilitates forward propulsion is ill-founded. However, to determine the effect on angular momentum one must also consider the moment of inertia. Moment of inertia resists the tendency of a body to resist rotational acceleration when acted upon by a torque. Angular momentum is the product of rotational velocity by moment of inertia. Moment of inertia is greater for a less compact object. When a pirouetting ice skater extends his/her arms the moment of inertia increases and the speed of rotation slows, while angular momentum remains constant. As the mass of the runner’s body moves further from the point of support, the moment of inertia around that pivot point increases, and as a result, it is possible for the angular momentum in the face-forward direction to actually increase even as the speed of rotation slows. Thus, in some circumstances it is true to say that angular momentum in a face-forward direction does increase after mid-stance but this effect has no forward propulsive effect. In the absence of wind resistance, an oppositely direct change in angular momentum occurred before mid-stance. In the presence of wind resistance, it is true that leaning forwards, to increase ‘gravitational torque’ about the pivot point does help oppose the oppositely directed torque exerted by the pressure of a head-wind on the body. When the coefficient of friction between two surfaces is low, and a force is applied obliquely to the interface, the ratio of vertical pressure (which promotes stiction) and the horizontal force (which promotes sliding) must be high to prevent slipping of one surface over the other. The coefficient of friction is minimal for a foot on ice. Therefore, in order to run on ice, it is essential to spend a very short time on stance, so that the long axis of the body never becomes more than very slightly oblique while on stance. This demands a very short time on stance. As well shall see in the next section, very short time on stance is associated with large vertical ground reaction forces. Nonetheless, running on ice is possible, though it is a stringent test of the ability to lift the foot from stance quickly. While forward momentum can be maintained fairly easily provide the braking forces in the first half of stance are kept within reasonable limits, getting airborne is both consumptive of energy and risky. Acceleration upwards requires a vertically directed force. The only external force that acts upwards on the body is vGRF (apart from a trivial contribution from air drag as the body falls). As discussed above, vGRF is the reaction of the ground as it resists compression by the vertical downwards force exerted by the body via the legs. These vertically downwards forces are body weight, and downwards push by contracting muscles or elastic recoil of stretch tissues. If time on stance is equal to time airborne, average vGRF is twice body weight. Conclusion: If time on stance is only a small fraction of total stride duration, average vGRF is many times greater than body weight. To elicit such a vGRF, a powerful downwards push by the leg on the ground is required. At least some of this downward push can be supplied by elastic recoil of tissues that were stretched at impact. However, it is likely that capture of energy impact and its subsequent recovery can only be performed efficiently if time on stance is quite short. The improvement in efficiency with decreased time on stance presents us with the central challenge of the dance with the devil. When time on stance is short, vGRF is high. Exerting a push that is several times body weight is likely to demand strong muscles and is very consumptive of energy unless a substantial proportion of the energy released by the impact at foot fall can be stored as elastic potential and recovered in late stance to help generate the vGRF required to propel the body upwards. However, efficient capture of the impact energy and its subsequent recovery is likely to place substantial stress on muscles, tendons and ligaments, unless it is done very skilfully. If forces many times body weight are applied very abruptly, the risk of injury is likely to be high. What is required is a finely controlled foot fall that results a large rise in vGRF over a relatively short time while avoiding a very abrupt rise. Strictly speaking, this principle is not a direct consequence only of Newtonian mechanics, but also depends on the science of materials. The way in which structures fail when stress is applied is determined in part by the intrinsic properties of the material. For example, kangaroo tail tendon is more capable of absorbing stress without failure than any other material, but all mammalian tendon is fairly tough due to the properties of the collagen protein. The failure of a structure under load is also determined by extrinsic design of the structure. The way in which load can be transferred from the lateral edge to the medial arch of the foot in the first 20-30 milliseconds after foot fall provides increased ability to absorb stress. In the subsequent section on biodynamics we will address the question of what specific orientation of joints and tensioning of muscles might facilitate a relatively slow rate of rise of stress on foot fall. Another major factor to consider is cadence. Because a freely falling body accelerates steadily under the constant influence of gravity, the downwards speed of the body at the end of the airborne period is much greater for a longer airborne duration. Thus, the total distance of fall during a series of many short duration airborne periods is less than that for a series of fewer longer duration airborne period of the same total duration, (This is demonstrated mathematically in the calculations page on the side bar of this blog). Thus a high cadence requires less energy expenditure in raising the body and less severe impact forces. The foot and leg must be accelerated forwards relative to the torso (and relative to the ground) in the early part of the swing phase, but then decelerated in the second half of swing so that at footfall the foot is travelling backwards relative to the torso. Once the foot is on stance, speed of the foot relative to the ground must be zero. Thus, during each gait cycle, the foot is accelerated from rest to a speed somewhat greater than the speed of the torso and then decelerated to rest once again. The acceleration and deceleration can in principle be performed either by external forces acting on the foot (horizontal GRF) or by internal forces. Unless the body is on stance for an infinitesimally small time (which would necessarily be associated with huge values of vGRF) the legs must be angled obliquely forward and down during the first part of stance, resulting in a braking force acting on the foot and similarly, obliquely backwards and down during the second half of resulting in forward acceleration of the foot. Therefore at least some of the impulse required to accelerate and decelerate the foot and leg will be provided by external forces. As discussed in the previous section, a short time on stance is preferable with a view to efficient capture of the energy of impact as elastic energy and the subsequent re-use of that energy to help propel the body upwards for the next airborne phase. When time on stance is short compared to airborne time, the amount of acceleration of the foot and leg necessary to allow the foot to overtake the torso in mid-swing is lower than when time on stance is a large part of total stride duration. For example, if time on stance is half of stride duration the average velocity of the foot must be twice that of the torso if the foot by the time the swinging foot passes under the COG, whereas if the time on stance is one fifth of total stride duration, the average velocity of the swinging foot during the first part of swing need only be about 20% greater than the velocity of the torso. Thus, if speed and cadence are fixed, the energy cost of repositioning the swing leg is less when time on stance is short. However, at higher speed, the COG moves a greater distance forward while the foot is on stance, necessitating a larger range of motion of the foot during the subsequent swing phase. It can readily be shown that the energy cost of the swing for each step increases as the square of the speed. However, because the number of steps per unit distance travelled decreases as speed increases, the swing cost per unit distance travelled increases only linearly with increasing speed. On the other hand, the number of steps per unit distance (at a given speed) increases in proportion to cadence, the swing cost increases in proportion to cadence. Thus, the overall effect is that the energy cost of repositioning the swing leg increases in proportion to both speed and cadence. 4) The impulse require to lift the body against gravity must be provided by a downwards push of the leg against the ground. 6) Landing in front of the COG is inevitable to balance the effects of the forward directed hGRF acting in the second half of stance. 7) The energy cost (per unit distance) of repositioning the swinging leg increases with increasing running speed and also with increasing cadence. These principles are essential for efficient running irrespective of the specific running style adopted. In the next section, we will address the question of which specific muscle actions are mostly likely to achieve these principles efficiently and safely. Great post. Hope to read even more good posts in the near future. No. Efficiency is maintained at the highest cadence possible at all times. At slower speed, the amount of airborne time and air glide distance should be reduced. Thus there comes a point where the “old men” shuffle is employed, landing one foot before lifting the other, without any free fall. Also, Cavanagh and LaFortune (Journal of Biomechanics, 1980) in figure 1 does not fit or accurately describe the shuffle, or the transition to airborne strides when the runner barely gets off the ground. JG, Thank you for your comment. We appear to agree that it is more efficient to spend longer on stance at very slow speeds. I think perhaps you had missed the word ‘if’ in my sentence. I was presenting an argument as to why is would be less efficient to spend a short time on stance at slow speed, in agreement with your statement that at low speed, runners spend longer on stance. This is readily observed if you watch elite athletes jogging, and is supported by the data presented by Cavagna, Thys and Zamboni (J Physiology, 262, 639-637, 1976). I accept that my description of what is most efficient at slow speeds was misleading insofar as I only discussed the work against gravity ( and I have changed the text to reduce risk of confusion) . If the runner lengthens time on stance, the airborne time and the cost of lifting against gravity can be reduced. I suspect that the major energy cost at very slow speed is the cost of swinging the legs. It is difficult to calculate this cost using Newtonian mechanical theory, because some of the energy expended in swinging the leg forward is provided by elastic recoil. However I would expect that the energy required to swing the leg is least when the cadence approximately matches the natural swing period of the leg. It should be noted that the natural swing period of a fully extended leg is longer than the natural swing period of a leg flexed at the knee because a longer pendulum swings more slowly. Therefore, I would predict that it is more efficient to decrease cadence at slower speeds. The data presented by Cavagna, Thys and Zamboni confirms that this is the case in practice I therefore disagree with your statement that ‘Efficiency is maintained at the highest cadence possible at all times’. I’ve read your blog for while and appreciate your analytical mind and good background. However, one area that you could tighten up on your understanding of mechanics is the topic of “Gravitational torque”. Gravitational torque seems to widely misunderstood and misused in the context of running. Gravitational torque is actually zero for a body in a uniform gravitational field. The only time Gravitational torque is non zero is when the gravitational field varies across a body, but to achieve this you have to have planetary scales, such as the relationship between the moon and the earth. When you go down to scales of human level the gravitational field at the head and foot at essential constant. If you want to be really precise then yes then is a tiny tiny variation with the feet closer to the earth that then head so under greater gravitational pull so when you lean you’ll experience a minute torque and a torque that works to upright you. This torque is so close to zero that you’ll never be able to measure it. If you’ve been used to thinking about Gravitional Torque in the wrong way it might take a little while to come around to the proper understanding of the mechanics at play. One thing that might help is to consider what happens the the runners body in flight – the force of gravity is the same as when on the ground but the any lean you have in the air won’t produce any torque – you won’t suddenly start pitching over mid flight. This observation is pretty obvious, and hopefully will lead one on to the next observation – if it’s not gravity pitching you over when on stance what is? Simply the force we generate from our legs that are supporting us. If you push off with a resulting force vector that is goes above the center of mass you’ll pitch head forward, if you push off more horizontally below the center of mass you’ll pitch head back. Now for a runner you don’t want lots of pitching of the head back and forward during the gait cycle – so a well balanced runner will actually generate force vectors on landing, mid stance through to push off that go roughly through the center of mass. Think about the force vector going from point backwards towards the center of mass on landing, upwards at mid stance and then forwards through the center of mass on push off. I suspect once you grasp the above then the fact that lean doesn’t actually propel you will drop out automatically – gravity is vertical force and can’t providing any propulsion. The whole ideal of Gravitional Torque in the context of running is basically a mis-understanding of mechanics, as soon as you see someone mention this idea in the context of running rather than planets you know they have lost their way. Thanks for your comment. I strongly agree with you that gravity does not provide horizontal propulsion when running. Indeed in my various debates with Pose advocates, such as my post on 14th February 2010 and in the ensuing comments ( https://canute1.wordpress.com/2010/02/14/problems-with-pose/#comments) one of my main points has been that gravity does not provide forward propulsion. We are also in agreement that no gravitational torque acts on the body while it is airborne. However I think we disagree about the existence of gravitational torque when the centre of gravity (COG) of the body is not aligned over the point of support during stance. As illustrated in the figure in my posting on Feb 14th, when COG is in front of the point of support, the line from the point of support to COG slopes forwards. The downwards gravitational force acting through the COG can be decomposed into a component that acts along the line connecting the COG to the point of support and a component acting at right angles to this line. Thus the body is like a pivoted rod with a force acting on it at a distance from the pivot point. A torque acts, producing a head forwards and downwards rotational acceleration. This torque acts similarly to the torque that acts on an off-vertical column whose COG has been displaced laterally so that it is no longer over its base, causing the column to topple over. However contrary to the claims of many Pose advocates, this rotational acceleration does not produce net horizontal movement when running. In fact, in order to prevent a face-down crash, it is necessary that a torque acts in the opposite direction at some other stage in the gait cycle. Except when running into a very strong head wind, the major part of this oppositely directed torque arises from the effect of gravity when the COG is behind the point of support. I believe that are still making two mistakes that are causing confusion. First up “gravitational torque is zero in uniform gravitational field”, I mentioned this in my first post, but repeat it again as the point doesn’t seem to have stuck. I would suggest you do so background reading on what exactly gravitational torque is, how it effects planetary bodies is fascinating and well worth investing so quality geek time on. In the context for the debate on running mechanics we can safely assume gravitational torque is zero. It’s zero regardless of what we do with our bodies and what point we are on stance or in the air. It’s always zero. If you don’t yet agree on this then you need to go back to some more fun background reading on those loverly astral bodies. What you describe in your reply is not an explanation of gravitational torque but mistaken breakdown of the moments at play. The mistake is using the foot as the point of rotation – you should instead think about the center of mass as the point of rotation and then consider all the forces and moments that act upon the center of mass. As soon as you change to using the center of mass you’ll find that maths and understanding should simplify and become clear. In mechanics the concept of centre of mass is used for this reason – it’s simplifies analysis. air resistance so are minimal. I know you explanation in your blog entry isn’t far from this explanation, it just needs a wee tweak to get things on a firmer grounding of mechanics. I think we are using the word gravitational torque differently. I am using it to mean a torque acting on a body arising from gravitational force, though in the case of the human body running on the earth, the foot is pressed on the ground during stance so there is also a ground reaction force. GRF completes the couple that is necessary to produce rotation. In the case of the astral bodies to which you refer, there is no ground reaction force and as you say, there will be no torque if the gravitational field is uniform. There is no doubt that a body standing on the earth’s surface with its centre of mass above a point that is outside its base will rotate. As I described in my previous response, this is why a leaning column or tower will topple once the vertical line from its COG to the ground lies outside of it base. I agree with you that the amount of torque is small when running efficiently, because it is inefficient to suffer a large braking impulse which then has to be overcome by an active propulsive push. However some torque is unavoidable unless the time on stance is infinitesimally small, in which case peak vertical ground reaction force would be infinite, and the metatarsals would fracture. Oh dear I was hoping that I made explained things clearly enough, I’m afraid I’m far better at understanding dynamics than I am at explaining things. Indeed we are. I’m using the correct scientifically recognized meaning of gravitational torque, and you are using mis-using the term completely. To use the term gravitational torque in the context you are using is pseudo science, it’s understanding the idea is appealing but it’s not correct. This is where you go wrong. Gravity in uniform field doesn’t create any torque whatsoever. You are confusing things. The effect of Gravity on use doesn’t change when we are in the air or on stance – when we are in a uniform gravitational field it’s invariant. This means we can rule out Gravity from the equation. The force generated by the body and applied through the foot to the ground is not a reaction force in the way you are thinking. It’s not a force in reaction to Gravity. The forces we generate on stance are typically peak well over 2G and in some runners with short time on stance vs time in the air can peak over 4G. There is a reaction force from the ground that equalizes these big forces we are generating but it’s not a reaction force directly due to Gravity. A static body yes, but it’s not Gravity that is creating the rotation, it’s the supporting forces that create the rotation. I realize this is subtle point but it’s hugely important one if you want to grasp what is going and how to analysis it correctly. On slightly different note, I believe thinking about an initially static column which is passively toppling over is a rather misleading model to use when considering a runner on stance. The column is rotating and lowering it’s center of mass as it begins to fall, with the supporting forces lower than the force of gravity. With the runner the lowest point of the center of mass is at mid stance when the center of mass is right over the foot, once you are past this point center of mass begins to accelerate upwards through to to off – we aren’t falling forwards at all but leaping up and forwards, actively pushing off with forces much greater than gravity. Thanks for your continued comments. I am happy to accept that my use of the term ‘gravitational torque’ is not in accord with your use of the term, and perhaps in astrophysics, your usage is correct. However the important issue here is not the terminology but what actually happens to the body when its COG is not above its point of support. I agree with the points you make about the net force acting on the body after mid-stance. Because of GRF acting against the elastic recoil of the leg muscles, the net force is forwards and upwards, as shown in my figure in my posting of 14th February 2010. To determine the net force activity in the body we need to consider the following forces: gravity; ground reaction to gravity; elastic recoil of leg muscles pushing against the ground and GRF to this elastic recoil; and wind pressure. The effect of gravity is overcome by the force of elastic recoil, but gravity is not abolished by elastic recoil so we must take it into account. Would the Leaning Tower of Pisa have rotated as it fell if its COG had moved so far sideways that that the vertical line from its COG no longer passed through the base? We are in agreement that GRF plays an important role in the fate of the tower, but I maintain that gravity also plays a key role and indeed might be regarded as the major contributor. The rotation is a consequence of the couple produced by gravity, which effectively acts through the COG, and GRF, which acts at the point of contact with the ground. I suppose to be strictly correct I should call this torque ‘the torque produced by gravity interacting with GRF’ but this would be cumbersome. It should also be noted that in this situation the GRF only exists because gravity pulls the tower towards the centre of the earth, so in my opinion gravity is the major partner in the couple. However I must reiterate that I am in complete agreement with you that net force on the runners body after mid-stance is forwards and upwards. This was the key point of my critique of the theory underlying Pose. As described in my discussion of the forces acting on the runner after mid-stance in post of 14th Feb 2010, I believe that fig 7 in Romanov & Fletcher (Sports Biomechanics, 2007) seriously underestimates the magnitude of the GRF. Romanov and Fletcher do not appear to include the GRF created as a reaction to elastic recoil by the leg muscles. When this is included, the forward and upward directed GRF exceeds gravity, accounting of the fact that the body becomes airborne. Getting airborne is the essence of running. Contrary to Pose theory, the body does not fall after mid-stance. Nonetheless, despite the fact that the COG is rising, there is a torque that produces rotational acceration in the head forwards and downwards direction, and this must be cancelled at some point in the gait cycle if a subsequent face-down crash is to be avoided. You keep making the same mistakes in your analysis. You keep focusing on the foot as the point of rotation, this is in fact a very poor reference frame to integrate the forces about when considering the dynamics of runner. Use the bottom of tower as a point of reference is OK as it’s a fixed point of reference, using it simplifies the maths greatly. However, this simplification in now way applies to the case of the dynamics of a runner, and you are confusing yourself by trying to use this approach. The reason is that while the foot is a fixed point relative to the ground it’s not a fixed point relative to the center of mass. Using the foot as a reference frame requires you to delve into using lots of complicate maths that account for the changing moment of inertia relative to the foot as the moves closer to the body at mid stance then further away towards toe off. Lots of complications also arise need to account for angular and radial accelerations associated with using the foot as a reference point. Then what happens when the foot leaves the ground… where’s your reference point now? Does it stay at the ground where you pushed off, stay with the foot your started with? Magically jump to a different part of the body? For all these reasons it’s a terrible ideal to use the foot as point of reference, it just complicates everything massively, and your maths doesn’t come close to integrating all these factors. The right way to tackle dynamics of runner is to use the center of mass as your point of reference. You should integrate all the forces that gravity, air resistance and forces generated through the foot around the center of mass. The moment of inertial does still change a little through the gait cycle even relative to the center of mass but the changes are minimized as it’s the center rather than an outlining point on the body, so it’s not a gross simplification to assume that it’s constant. The beauty of using the center of mass for all your maths is that it completely avoids any of the confusion you have about your idea of “gravitational moments”. Using of the center of mass also keeps the same reference frame throughout the gait cycle – there is not need for thinking on stance or in air, the maths all works exactly the same all the time. So please make the effort to recode the way you are thinking about the mechanics of the running gait. Center of Mass is where it’s at. Once you have grasped this things will hopefully become simpler, clearer and more elegantly integrated. Thanks for your perseverance with this issue. Before responding to your recent comments, it is probably important to step back and try to define exactly what we are debating. The first point to make is that we are in agreement about the most important feature that distinguishes running from walking: namely, the body become airborne at the end of stance. The most important force to consider during stance is the force that gets us airborne. This force is largely generated by elastic recoil whereby the energy that had been stored in muscles and tendons following the impact of footfall, is released. It produces an upwards and slightly forward acceleration of the body. I think we are in agreement about this. I also believe that rotational motion due to gravity plays a small role, and as I understand it, you disagree with my account of this rotational effect of gravity. The main reason I have introduced discussion of this rotation into my account of running mechanics is to demonstrate that it does not produce forward propulsion, contrary to the claims of Pose theory. While I do not think this disagreement matters very much because the rotational effect is relatively minor, I do think that there is at least some value in discussing this rotational motion because it is relevant to understanding why runners always land with point of support slightly in front of the COG when running at constant velocity. So I will attempt once more to explain the mechanism by which gravity produces rotational motion during stance. While on stance, the foot is almost stationary relative to the ground, and the point of contact acts as a pivot point as the knee moves forward relative to the foot. [Note that that when describing rotation about the point of support, contrary to your suggestion, it would make things more complicated to describe the motion relative to the COG]. This rotation of the lower leg around the pivot point is sustained mainly by the forward momentum of the body, which is approximately constant, and therefore the angular velocity associated with this forward momentum is almost constant. However, gravity produces a small perturbation of this rotation. Because gravity acts vertically, when the COG is in front of the point of support the forward sloping line from the point of support to COG is at an angle to gravity. Therefore, the force of gravity has a small component at right angles to the line from point of support to COG, as illustrated in the figure in my post of 14 Fen 2010. Because the point of support is (almost) fixed to the ground, this component of gravity produces angular acceleration in a head forward direction about the point of support. Similarly, when the COG is behind the point of support, a torque acts but the angular acceleration is in the opposite direction. You quite correctly point out that on account of extension of knee and hip, the moment of inertia of the body changes during stance, so a precise calculation of the angular acceleration produced by the torque would be very complex. However, my purpose was not too produce a precise calculation of the angular acceleration, but merely to illustrate the direction of rotational acceleration before and after mid-stance. The direction of the rotational effect is not be altered by the changes in the moment of inertia. The crucial point is that it is essential that the net rotational acceleration of the body averaged over the gait cycle is zero if we are to avoid rotating out of control. Contrary to Pose theory, gravitational torque does not provide forward propulsion and there is no fall after mid-stance. > Thanks for your perseverance with this issue. I understand your motivation for trying to untangle the web of confusion/deceit that surrounds Pose method and theory. Unfortunately your methodology uses the same language and few similar ideas in the way your analyse the running gait – your analysis is more correct that that of Pose, and you rather than try to conjure up some magical propulsion you work to illustrate that there is no net propulsion or rotation from gravity. You are going in the right direction and with the intent that I would applaud, but I do believe you still have a little way to go before nail the topic. I little background about myself so you know where I’m coming from. I’m well versed in mechanics and analysis and dynamic systems having a background in Engineering, so this types of analysis comes as second nature. Unfortunately I don’t have any background in teaching though, so please forgive me if I’m not so good at explaining the right way to think about dynamics, and how to explain why certain approach are mistaken. Over the last few years I’ve got back into running, and being a analytical type I can’t help study the topic in my spare time and have been rather surprised at how poorly mechanics of running is expressed. There are the real shockers like Pose and Chi Running that fabric whole new interpretations of how gravity works, but even when there aren’t humdingers like these there still is a great deal of misconceptions or poor explanation of the dynamics. Things that I would have expected to be totally settled science for half a century by now seem still to be totally up in the air. Your own blog is one of the few that comes close to properly explaining the dynamics of running, but as I said before you are still tackling things in the wrong way. The key mistake is that you are using the foot as point of reference. I understand that it may feel like the intuitive place to start, but unfortunately it leads subtle complexities in the analysis that can very easily be overlooked, these subtle might seem insignificant but they can actually be very profound. I’m still hoping that I might help shine a light on this topic for you and before Christmas have your own moment of clarity where things suddenly become clearer. In your replies you are still trying to explain your analysis which suggests you haven’t yet grasped what I’ve tried to explain. This tells me that I haven’t yet got my head around how to explain why one should make the leap of faith and adopt my suggestions on how to analyse things. I’ll have another bash working out how to explain using the foot as point of reference is mistake, but I’ll leave that to another comment as I don’t wont to try a cram too many different points into a single bit of text. I’m curious, I know that you still believe in your own analysis, but is that anything specific about my explanation of how to use the center of mass as a frame of reference or why that doesn’t seem clear? Is there something I can add? I am delighted to hear that you have a background in engineering, because I would really value the opportunity to discuss running mechanics with an engineer. As you remark, it is surprising that running mechanics is still so poorly understood, although many factors make precise computations difficult. These include the complexity of motion of a multi-jointed body, and the fact that tendons are viscoelastic and therefore, force generated by recoil depends on time on stance. With regard to our recent discussion, my reason for persisting with the description of rotation relative to the point of support is that when dealing with a complex system it is crucial to find a reference point that simplifies the description, and it seems to me that when describing the forces that act on the body while on stance, there are two cardinal points: the point of support and the COG. This is why I describe the forces and motion in relation to the line joining point of support to COG. With regard to the points you have made, the main issue is that I fail to see how the description is made simper by describing the forces and motion relative to the COG. However I would be happy for further enlightenment on this issue. With regard to my degree of faith in my own analysis, I am far from fully confident. There are two particular issues that concern me. First, the point of support is not actually fixed during stance, though the pattern of movement depends on the nature of the foot strike. Ironically, the easiest foot-strike to describe is the exaggerated forefoot-strike illustrated by Dr Romanov in his book, The Pose Method of Running, because the ball of the foot remains almost perfectly fixed during stance. I believe that the ‘pose’ as illustrated by Dr Romanov is bad, at least for distance runners, because this posture demands high tension in the Achilles tendon and the repetition of thousands of steps during distance running creates a serious risk of damage to the Achilles itself and to plantar fascia. However, for a sprinter who takes only a few dozen strides in a race, forefoot landing is preferable. Therefore, at least for the time being, I am happy to try to describe the running gait as if the point of support was fixed under the ball of the foot during stance, even though this is not accurate for distance runners. But maybe this issue could be avoided by describing motion relative to the COG. My second point of concern about my analysis is that it demands equal but opposite rotational impulses before and after mid-stance. Examination of high speed video recordings (such as those produced by Peter Larson) clearly demonstrates that for most good runners, the line from point of support to COG is displaced further from vertical at lift-off than at footfall. If the body was a rigid rod, the greater slope after mid-stance would result in the magnitude of angular impulse after mid-stance exceeding the magnitude of the impulse before mid-stance, leading to an uncontrolled rotational acceleration. I assume that the explanation for this puzzle is that the moment of inertia of the body (around the point of support) is substantially greater at lift-off than at foot fall and hence, despite a greater angular impulse after mid-stance, the acceleration is no greater. While I think this is plausible, I would be pleased to have a stronger argument to support this. Maybe a description in terms of motion relative to the COG would help provide a stronger argument. Why is using the foot as a frame of reference not appropriate? I think one of the key problems is that it’s too easy to mix up how the forces and moments, rotations and translations all interact. What makes it hard to untangle is that using the foot as frame of reference at first seem like the intuitive place to use reference point as it fixed point. When we think about the Gravity acting upon the center of mass offset from the foot it’s easy to resolve all the forces and conclude there is a moment about the foot that is going to rotate the body. However, the subtle mistake is that rotation is w.r.t foot, not a rotation of the body w.r.t it’s own center of mass. If you look at the actual dynamics of the runner after mid stance the rear leg is indeed rotating forwards, but the body remains near vertical and doesn’t rotate, and the other leg is actually rotating in the opposite direction. Canute, I know you’ve explain this as well, and in your analysis point to the rotation due to Gravity being much smaller than these motions, but actually even the subtle rotation is actually not actually correct – it’s a mistake down to the frame of reference, in reality there isn’t actual a rotation due to Gravity, I know this as there is Gravitation Torque is zero in a unified gravitational field. It’s a bit like knowing that Pose theory has to be wrong because you require net height loss to be able exchange gravitational energy for kinetic energy – it;s a basic law that if you break you know you are going wrong somewhere, even if you can’t pinpoint where you going specifically wrong. Another trick to know that something is amiss is to do a summation of all the forces and movements around the center of mass. This is usual place to do dynamics analysis, and only in a few cases will you ever not use this as the reference frame, calculating everything around the center of mass simplifies the maths greatly making it much easier to avoid making silly mistakes. So if you look at the center of mass and do the analysis do you get the same result as your current analysis around the foot. Well if you do the analysis straight away you know that center of mass and center of gravity are co-incident in a unified gravitational field so no moment so no rotation due to Gravity. Again this should jump out at your as inconsistent with the simplistic analysis around the foot. Alarm bells should be ringing that there is something amiss with the analysis around the foot. One last thing I’d add as dinner is on the table 😉 Have a think about a shot putter throwing a shot put. When the shot put is being pushed out from the shoulder it’s not too dissimilar to the runner pushing off at the second half of stance. Gravity is acting upon the shot during the push and afterwards in exactly the same way. After the shot leave the hand it’s path will be the stand parabolic ballistic path – just the same as the runner as well. Now the path relative the shot putter shoulder the shot actually is rotating all the time to eventually come to level when it comes down to the shoulder height then dips down to hit the ground. While there is a rotation relative to the shoulder, the shot it’s being rotated in on it’s own axis by gravity – it’s merely accelerating earthwards. I hope this last point highlights the subtle mistake – it might be subtle but profound when it comes to understand what is really happening. Thank you for your continuing thought provoking comments. First let me comment on the points of agreement. 1)	I agree that the torso does not usually rotate even during stance. However the lower leg unequivocally pivots around the point of support. So some parts of the body rotate relative to the point of support, though being a non-rigid body, the relationship between body parts can change. Furthermore, the line from point of support to COG pivots around the point of support. As mentioned in my recent comment, I regard the line from point of support to COG as the most relevant simple representation of the body for the present purpose, and when I refer to rotation, I am referring to rotation of this line. 2)	I accept that a shot put follows a ballistic parabolic trajectory but do not think this invalidates my claim that for a runner, equal and opposite rotation acceleration occurs during early and late stance. At lift off, the body is not rotating and will follow an approximately parabolic trajectory with no rotation. A rod-shaped asteroid is in approximately circular orbit around a far distant but massive sun, with the long axis of the asteroid pointing towards the sun. Because the sun is distant, the local gravitational field can be considered uniform. The direction of motion of the COG is tangential to the line from sun to asteroid. This steady orbital motion is temporarily interrupted when the end of the asteroid pointing to the sun makes grazing contact with a piece of space junk travelling rapidly in the opposite direction. The space junk is of such light construction that it produces negligible distortion of the gravitational field, but its velocity gives it appreciable momentum and consequently the impact is sufficiently forceful that the orbital motion of the end of the asteroid is arrested for a brief moment, while the COG of the asteroid continues onwards under the influence of its momentum. During the brief period of contact, the long axis of the asteroid will become aligned obliquely relative to the sun’s gravitational pull. The asteroid has rotated around the point of contact. What will happen after the asteroid and space junk part company? Will the asteroid continue to rotate around its own COG, like opposing spokes of a cartwheel, as it continues in its orbit. If so, the impact has imparted angular momentum to the asteroid, despite the near perfect uniformity of the gravitational field. I would of course be quite happy if you wish to say the torque should be labelled ‘impact torque’. Oh dear. I see we still haven’t made the leap to moving away from using the foot as a reference point and thinking of the problem as a generalization of the falling column model. You keep making the exactly same mistakes in your analysis. Your thought experiment about the asteroid and impact torque really doesn’t help clarifies things for you, it’s a bit of misdirection. You need to make the leap to accepting that “Gravitational Torque is zero in a uniform gravitational field”, this is just a much as fundamental aspect to mechanics as conservation of momentum. It doesn’t matter what scale you are at, this same rule applies to a fly, a molecule, a whole human, a shot put… Whether you are on stance or not the Gravitational Torque it’s always zero. As soon as you start thinking about a model where this isn’t the case you should straight away start looking for your error, just as you would if you suddenly gained or lost energy from the system. Part of your confusion is that you treat the force of gravity activity at the center of mass creating a rotation about the foot as the same as the forces from the foot acting around the center of mass. They aren’t the same at all, it’s only in the special case of static object can you start making simplifications like these. The rotational moments about the runners center of mass only come from the forces generated by the leg and applied through the foot and the any moment generated by wind resistance. Gravity doesn’t create *any* rotational moments. You do pick out that we are generating the forces through out feet and this forces act upon our center of mass, but one key mistake you are making is equating this force with the force of gravity. This forces will only be equal when we are static and balanced. When we run these forces vary between 0 and well over 2G when on stance. The forces we generate aren’t vertical but have a horizontal and vertical component – the resultant of these vertical and horizontal forces provides a force vector that points back towards the center of mass – this may or may not generate a moment depending upon the balance of horizontal and vertical forces we generate. I am a bit surprised the penny hasn’t dropped yet. I’m a bit stumped what else I can say to clarifies things. It might just take a leap of faith in what I’m saying for you to leave behind your old analsysis and embrace using the center of mass. I have a vague recollection when I was 16 or 17 and being taught applied mechanics at School when I made a mistake in an analysis and my teacher got it across to me that the right way to tackle the dynamics problems is to use the center of mass. Not long after I ended up study Engineering and Computer Science at Oxford so I guess the teacher did well by me. I really hope you can achieve the moment of clarity that it suddenly all makes sense. Please make the effort to think about forces about the center of mass, I know right now you can’t really see what the benefit, but once you get over this hurdle you’ll become a much more accomplished in the field of analysis of dynamics. Does the asteroid rotate? If so it seems to me that it demonstrates that torque can be generated by an impact acting in a uniform gravitational field. It appears that your objection is to the term ‘gravitational torque’. I am perfectly happy to call this ‘impact torque’ for the purposes of our discussion. Whatever terminology we use, it appears to me the a small ‘head-back’ rotational acceleration occurs in early stance and a small ‘head-forward’ rotational acceleration occurs after mid-stance. That is the essential point, though it is a relatively minor feature of the mechanics of running. The astroid example has nothing to do with gravity, it’s a pure example of transference of momentum. As I said before this example isn’t helping you understand things, it’s just a distraction. Yes, I object to misusing the expression “Gravitational Torque”, However this doesn’t change my objection to your analysis doesn’t rest of terms of language usage but mistaken conclusions based on a erroneous frame of reference. But there isn’t any “impact torque” in the context of a runner who is runner well balanced – the runner should be generating the appropriate balance of horizontal and vertical forces on stance to keep the resultant point through the center of mass. The only time there is an “impact torque” in the way you are thinking is in the runner generates too much vertical or horizontal forces on stance that the resultant no longer goes up through the center of mass on stance are creates a moment. However, this torque isn’t anything to do with gravity, it’s purely an in-balance in the forces generated by body. None of will have achieve the perfect of horizontal and vertical forces on stance, but the more efficient a runner is the lower I expect this in-balances will be. This view of your only holds true if the runner generates too much vertical force relative the horizontal forces early in and late when on stance. Remember, it’s all about how the resultant forces on the body resolve relative to the center of mass – it’s these forces that pitch us head up or head down, it’s not gravity. We are in complete control of these forces so there is nothing inevitable about pitch back and forwards. The mistake of using the wrong reference frame is that linear forces and motions offset from the origin appear like rotations relative to this origin where no actual rotation exists on the object. It is possible to handle this in the maths but you have to add a local rotation backwards to correct things, in doing so you end with horrible tangled mess of mess, which is why those experienced in dynamics analysis use the center of mass as the origin. Have a think about dropping a ball from extended arm – it drops relative to your hand and your eyes as the observer. Relative to your eyes you see it drop and in doing so it rotates relative to reference frame, you can even use your eyes as the origin of reference frame, but at no point does the ball actually rotate because of offset reference frame – it just appears to look like it’s rotating from where you are looking. Until you get over with your fixation of using the foot as point of reference you won’t be able to free yourself to properly understand the dynamics. You aren’t making all the mistakes that the Pose theory makes, but you are making some very similar ones. Once you get your head around this you’ll understand how my mention of the shot putter is directly relevant. the body to that generated by Gravity. I accept that the asteroid example is not informative about the runner on stance. I also accept that if we assume that the GRF acts along a line that passes through the COG there will be no torque that induces angular rotation about the COG. Thus I agree that there is not rotational acceleration about an axis through the COG. However that is not what I was claiming. As I stated in my comment yesterday, my analysis led to the conclusion that while the runner is on stance, the line joining point of support to the COG rotates around the point of support (in a head forward direction) and furthermore, during early stance this rotation slows slightly, whereas after mid-stance it accelerates by an equivalent amount. I also pointed out that this slight rotational deceleration and acceleration plays a trivial role in the mechanics of running. So the crucial point in our disagreement is whether or not it is meaningful to describe rotation about an axis that does not pass through the COG while there is no rotation about an axis though the COG itself. I readily admit that I am not an expert in the description of rotational motion, so I would be grateful if you would clarify this issue. The line joining the centre of mass of the pendulum to its point of support rotates around the point of support. 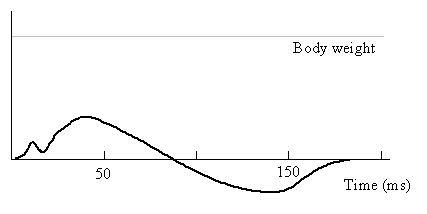 After the bob passes its lowest point, the rotation decelerates; as the bob approaches its low point, the rotation accelerates. You have asserted that the laws that apply to a static body do not apply to a running body but I have difficulty in understanding this. First of all, with regard to uniform horizontal motion, it seems to me that a pendulum within a railway carriage moving a constant velocity will exhibit the same motion relative to an observer in the railway carriage as if the carriage were stationary. The issue of the upwards acceleration of the runner driven by GRF to the force of recoil of muscles and tendons is more interesting, and calls to mind the perennial school play-ground debate about the merits of jumping in the air at the moment before impact if you are trapped in a freely falling lift. In the case of the runner, it is clearly crucial to take account of the upwards acceleration since that is what gets us airborne. Furthermore, the froce driving upward acceleration must exceed g or we would not get airborne. However in my analysis (illustrated in the figure in my post of 14 Feb 2010) I did allow for this upward component of GRF. I am aware of at least some of the issues that arise when dealing with changing frames of reference (eg the principle of Coriolis force) but cannot yet see how the frame of reference transformation alters the conclusion I have drawn about the slight deceleration and acceleration of the line joining the point of support to the runners COG while on stance. I agree that there will be a small horizontal acceleration of the body before mid stance and small equal horizontal acceleration of after mid stance that balances. This deceleration and acceleration being due to the horizontal component of the GRF acting upon the mass of the body. What I think is a mistake to think of this in reference frame of the foot and think of it as rotational acceleration/deceleration. Uses a formulation of the accelerations/decelerations based on the Gravity offset from the foot. These calculations are wrong because it’s the horizontal GRF that changing the acceleration not Gravity. The shape of the horizontal GRF is very different as well. If one does all the maths from the center of mass you don’t end up making this mistake. I find the best way to formulate the motion of the center of mass (or COG) is think in terms of moments and external forces being applied to the center of mass. The center of mass when in the air follows a parabolic path under Gravity, while on stance into follows a path that is rounded out V shape bottoming out near mid stance. I have seen mention of an upturned pendulum as a model for a runner on stance before and have never understood it. I don’t know if this what you are getting at, but I can only assume that the idea originated by someone who doesn’t have a clue about mechanics. The mechanics of a runner are very different from the pendulum, there is nothing that is common – the forces profiles and directions are completely different. I can’t see any sense whatsoever in using pendulum as model for a runner. after mid-stance and propel the body upwards. No I didn”t assert the laws are different, the laws of physics don’t change. It’s the formulation that is different – with a static body you can simplify the maths such as by equating the vertical GRF of a standing person being equal to their mass * Gravity and for the horizontal GRF to be zero. You can’t make these simplifications in dynamics, the GRF on average will equate to mass * Gravity, but the actual GRF’s vary greatly over time and have vertical and horizontal components. So you can’t apply the same techniques that work for static analysis. For a first order analysis of running gait I would recommend consider modeling the system as a simply body with it’s mass concentrate around it’s center of mass, that bounces along onto of spring loaded sticks (the pogo sticks) that have negligible mass. I’d also assume air resistance is zero. The path of the body has two distinct phases, on stance and in air, in air it follows the path determined be the force of Gravity (which is vertically downwards. The on stance we have the vertical and horizontal forces generated by the compressing or expanding springs. The longer the time on stance the wider the sprung loaded leg goes before and after stance. With a perfect spring and no air resistance we can assume a perfect energy return and equal profile of horizontal and vertical forces generate on stance. a series of smooth horizontal and vertical accelerations with no rotations. This is a first order analysis, and will give you a basic model and understanding of the main forces and motions of a runner gait. This model actually will work quite well for a runner on treadmill as there is no wind resistance. A second order analysis would add in air resistance, adding this in will mean that the net horizontal GRF now has to equal air resistance * (1+time_in_air/time_on_stance), and to achieve this time on stance before the center of mass goes over the ground contact point will be less than the time after. In essence we’ll have a forward lean to compensate for air resistance. A third order analysis you really have to start using a computational model as the maths really starts to get a bit too complicated to derive any answers by hand. Here you’d start modeling the individual motions of the legs and arms, feet and torso. Suddenly the whole model is far more complicated, you then start to need much more calibration of the model to real world runners body. I’d love to put together such a model and publish the code to it, perhaps someday I’ll get the opportunity. The complex model won’t do away for the usefulness of the simpler models. Even from the simply models we can learn a lot about running mechanics. I think that you have been prone to focus too much on our differences; I think we differ on only some very minor points. I did not claim that there is rotation about the COG. Nonetheless, I would be genuinely grateful if you would provide a more rational argument as to why it not correct to consider rotation about other axes. So far you have appealed to your fond memories of a teacher who helped you to get to univeristy, but you have not told me what justification the teacher provided for his/her advice. I look forward to hearing about the results of your analysis of the pogo stick model. I agree that this model does focus on one of the most important aspects of running,namely the elastic recoil that helps get us airborne. PS I had once explored a pogo stick model in the hope that it would help answer questions about the optimum time on stance, cadence and stride length, but I put this aside until I could identify an adequate way to take account of the viscoelastic properties of tendons and muscles. Without allowing for viscoelastic effects, I think it would not be possible to provide an adequate estimate of optimum time on stance. I would encourage you to explore the possibility of including viscoelastic properties in your model. I agree with most of your writing on running form, and from a distant perspective the points that I’m focusing on might look minor. I am pressing on these points as you’ve made errors that you could easily fix, and with fixing them you’d understand how to tackle dynamics analysis more easily and without making mistakes along the way. I thought I had provided rational arguments, but alas it doesn’t seem to been effective. The key mistake is not the axis, but reference frame and then type of analysis you have used. You should be using the center of mass as this avoids a number of problems with using your rotational analysis. The reason why the analysis around the foot is wrong is that your maths uses just gravity, and assumes a constant radius from the foot. A constant radius assumption is only accurate if the runner lands at the lowest point then rises to a high point at mid stance and then falls after wards. In reality the radius from the foot decreases rapidly from landing to mid stance, then increases from mid stance onwards. This change in radius requires handling as it effects both the moment of inertia of the system you have to use in your calculations and the rotational speed (rotational speed measured from the foot actually increases towards mid stance simply due shorted radius but similar linear speed) . The rate of change of radius between the center of mass of a runner and their foot on stance is not linear relationship and is non trivial to work out. The calculation of rate of change radius requires taking into account of the horizontal and vertical GRF as well as gravity. The angular acceleration also requires taking into account all these forces not just gravity. None of this is straight forward and is made far more complicated by trying analyses the motion about the foot. Since your maths takes practically none of these crucial elements into account it’s no wonder why you can’t make the sums add up. The route have gone leads to horribly complicated maths if you do things properly, but completely misleading results if you don’t. When do analysis you often look for simplifications that capture the key elements of what is going on, you have to be very aware of the impact of what these simplifications might have on the validity of the results. You’ve chosen some simplifications that result in errors that in of the same magnitude of the results you are obtaining so the results just aren’t meaningful. I’m afraid it’s too many years ago (back in the eighties) for me to remember the details, if I could have I would have tried to capture what he said and what the actual dynamics problem I was set to solve, but it’s all just blurry to me now. I vaguely remember getting stuck on problem, how to solve the problem was explained, I resisted for a while and then it suddenly came clear, then subsequent analysis become clearer and intuitive to me. The end result of this point is what I’ve remembered – choosing the appropriate reference frame and assumptions/simplifications is crucial to success and clarity of thought. Which is why I cut the the chase, explaining how I’d go about solving the problem avoiding the potential pitfalls. Unfortunately I’m no great educator as this little thread has proven! For all my efforts I don’t seem to have convinced you that just sticking to linear mechanics and center of mass as the best way to tackle the problem. Not having pen and paper to illustrate probably would help – I’m a visual rather than linguistic person. Thanks for the update and for the seasonal greeting. 1)	Ground reaction force acts alone a line from point of support to COG and gravity itself in effect acts through the COG, so ignoring possible differences in wind pressure on top and bottom parts of the body, there is no torque around the COG. 2)	Before mid-stance, there is a braking effect due to the backward component of GRF, which is a reaction to the impact of footfall, while after mid-stance there is acceleration due to the forward component of GRF, which is a reaction against the pressure exerted by the recoiling leg muscles. .
3)	When running at constant velocity (and ignoring the effect of wind resistance) the acceleration effect must exactly balance the braking effect. 4)	From the view point of a spectator, during stance there is a rotation of the line joining the point of support to the COG, around the point of support. Prior to mid-stance, the speed of rotation of the line from point of support to COG slows slightly while after mid-stance, it accelerates slightly. As far as I can see the only difference between our descriptions is whether or not one should describe the deceleration and acceleration of the rotation of the line joining point of support to COG as the consequence of a torque. As far as I can see this is a relatively trivial issue. The only issue that I consider to be of any importance is the conclusion that when running at constant velocity, the foot must land at least a slight distance in front of the COG unless there is a strong headwind (contrary to the misleading recommendation one frequently hears in discussions of running style that one should land under the COG). I hope you had good Christmas and that you have a happy New Year. I’d agree with you summary 1-3 but item 4 is wrong. Over my break I spent some time jotting down a basic mathematical model of dynamics and found that factors a and b are greater than the effect of the lowering of linear velocity from landing to mid-stance, so the actual rotation speeds up from landing to mid-stance, and then slows down from mid-stance to toe off. I did my maths for a runner at 180 cadence, 4ms speed, and a three types of gait based on the max number of G created at mid-stance, all three with sinusoidal vertical GRF. The three gaits were 2G, 3G and 4G, with the time on stance vs time on air being varied to achieve these max loading values – longer time on stance relating to lower peak loads. Curiously the low G gait with the longest time of stance had the largest vertical oscillation and the largest variation in linear velocity from landing to mid-stance and to toe off, but despite this slower the rest of the factors meant that this log G gait resulted in the greatest angular acceleration from landing to mid-stance. The high G loaded stances had much lower variation in horizontal and angular velocities, but in all cases the angular velocity increased to a maximum mid-stance and slowed afterwards. In term of horizontal distance between landing and mid-stance this varied with time on stance, so 2G was 52cm, 3G was 35cm, 4G 26cm. This is for zero drag, such as when on a treadmill, add air resistance in and you’d be able to knock around 5cm off to create the lean to balance wind resistance for the speed I used, so in all cases it’s still quite a long way in front of the COG. I believe these values are in line with what is observed of runners in the real world. What really surprised my in data is how much loading rate increases as you reduce time on stance – the 4G gait had over 4 times the loading rate of the 2G gait. While the overall leg stiffness was increased even faster, with the 4G cases requiring nearly 5 times greater leg stiffness – this is due to greater loads being created by a smaller radial variation on stance. I haven’t done the analysis on the internal loads, and my analysis was kept deliberately simplified to allow me to do the work out the values with the use of a very basic calculator. However, despite the crudeness of the analysis I believe it’ll be a reasonable first order stab at the dynamics. To get better results will require a using a computer model, as it was the holidays I didn’t fancy hacking away on a computer. Simply models still have their usefulness though as the trends and broad relationships fall out of the maths. This year I’m planning to start blogging myself, and feel it would be useful include articles on dynamics of running, publish the maths, and computer code used to generate the results so that others can verify and use them. Thank for your continuing comments and for your emphasis on the effects of diminishing distance between COG and point of support in the first half of stance. I agree that this makes the computation of angular velocity more complex than would be the case for a model in which knee and hip remained locked. I think that your simplified assumption of a sinusoidal trajectory is a useful model to illustrate some aspects of running mechanics. Certainly, some of the predictions of your calculations are as I would have expected. Contrary to your apparent surprise, I do not think it is at all curious that the low G gait with the longest time of stance has the largest variation in linear velocity from landing to mid-stance and to toe off. This is indeed the reason why I, and many others, have pointed out that short time on stance is more efficient, but the efficiency comes at the price of greater ground reaction force and greater risk of injury. The fact that you also find the greatest vertical oscillation with the low G gait is an inevitable consequence of your assumption of a sinusoidal trajectory, but might not in fact reflect the situation in a real runner. In practice it will depend on how much tension is maintained in the quads and hams. When I want to minimise jarring, for example while running down hill, I decrease the tension in the quads (achieved by thinking ‘soft knees’ rather than direct conscious control of the nerves supplying the quads) and in such circumstances I suspect I do have a large vertical oscillation while on stance. However, when I am running on a flat surface, I am fairly sure I have a much lower amount of vertical oscillation while on stance. This question needs to be answered using real data. Because of the complexity of the situation, I think that plotting the trajectory of the iliac crest from a video recording would probably be the best approach, though of course, it might also be necessary to take account of variation in the relationship between the iliac crest and the COG as the joints flex. So, a realistic calculation will prove difficult, but not beyond the bounds of computer modelling. With regard to your argument that angular velocity is lower in early stance when the linear vector has a downwards component than when at mid-stance when the linear velocity vector is perpendicular to the radial vector, this argument does not appear to take account of the linear deceleration that occurs in early stance. My claim regarding decreasing angular velocity in early stance is based on the expectation that the decrease in linear velocity in early stance is more than enough to compensate for the shortening of the leg due to flexion. I suspect this is the case under most circumstances, but I think that this can only be properly addressed using real data. As for your statement that even simple models have their value, I agree, though ultimately they must be tested against real data. I look forward to reading your blog. My assumption was that vertical GRF was sinusoidal, the trajectory that the results is not sin t – rather it has a sin term, a t squared and linear t term. I’d also like to point out that my analysis does take into account the deceleration of the horizontal velocity during the first half of the stance, the increase of angular velocity occurs inspite of this as the radius and initial orientation of the velocity vector on landing both at much larger factors and overwhelm an reduction in angular velocity due to the horizontal deceleration. I suspect once you’ve done the analysis properly yourself this finding will pop out. The assumption of a sinusoidal vGRF ignores viscoelasticity. Nonetheless I think your model is of some interest and I look forward to seeing the details of your computation. I’d go further, the assumption of sinusoidal vGRF totally ignores all attempts at directly model any of the forces that we generate! I chose to use a sin() term for the vGRF simply because it looks roughly like the vGRF of a forefoot runner, and it’s easy to integrate by hand. If I were model it on the computer I’d seek out some actual vGRF and hGRF data to use in place. However, the general relationships will hold even when using a crude approximation like a sin() vGRF, i.e. shorter time on stance vs time in air will always result in higher max loading and steeper loading rate no matter what the actual vGRF curve is. When I do get round to putting a computer model together of the dynamics I will be able to test the sin() approximation against real GRF data to see just how much errors occur. I don’t expect big errors though, unlikely to change the general conclusions you get from the use of the sin() approximation of vGRF. For you any journey into understanding running gait I would recommend that you try out deriving the maths afresh using my suggestion of the center of mass as the focal point. Once you have the maths for the horizontal and vertical velocities during flight and stance you can then derive the angular velocities relative to the foot, or anywhere else you fancy using as a point of reference. Using this approach you’ll avoid the pitfalls of trying to use over simplified angular analysis that misses out the most important terms (the effects of radial velocity)- the pitfall being the got the opposite results than you should have. This is really what I has hoping to get across by commenting here – not the particulars of running gait, just how to get the applied maths right. If the maths ain’t right, the results will be wrong, and any conclusions based on them wrong as well. Get the maths on a solid foundation and deeper insight can follow. I am not sure why you are reluctant to give details of your calculations. When I construct the equations for vertical and horizontal velocity of the COG employing what I understand to be your model, the equation for vertical velocity has a simple analytic form, but the equation for horizontal velocity does not have an obvious simple analytic form (though of course this may reflect the fact that is more than 45 years since I last employed calculus with serious intent). To get a simple equation I need to make a simplifying assumption about hGRF. hGRF is crucial for our present discussion, so I wonder, did you make any assumption about hGRF in your calculation, apart from the assuming that net GRF is aligned along the line from point of support to COG? > I am not sure why you are reluctant to give details of your calculations. I basically broke down the gait cycle in time in the air (Ta), and time on stance (Ts). A reference point 0 is the landing point, reference point 1 is mid stance, and reference point 2 is toe off. Assumed toe off and landing heights are identical, and with this vertical speed on landing (V0) and toe are the same, with opposite directions. An assumption of 0 drag means that the horizontal speed on landing and toe off can also assumed to be equal. For horizontal acceleration I assumed it’d be small enough to not affect the integration of the vertical velocity and path. Then to compute it’s effect, like you found that it’s not trivial and not having any calculus tables with me chose to compute the change in horizontal velocity by computing the horizontal component of force for t=0, t=Ts/8, t=Ts/4, t=Ts*3/8 and t=Ts/2 by simply multiplying the F(t) * tan(angle). I then averaged these values to give myself an estimate of the horizontal force in the first half of stance, and from this an estimate on the horizontal deceleration. This is rather crude but should be good enough to give us a reasonable estimate. Had I stuck the equations into a computer I would have used an iterative scheme, and could have been much more accurate in doing the integration of the horizontal and vertical velocities. The crude hand calculations won’t be that far off though. The paths, accelerations and velocities all looked reasonable from a real-world perspective and the relationships looked sensible so I’m happy with them as a first pass approximation. I’ve missed a few steps in maths, and obviously all the diagrams are missing, and I may well have made a mistake in trying to write down the equations. What I really need to do is write a proper article with diagrams, do the equations in a proper form, provide source code etc. Comments in a blog can’t do the topic justice. For all these elites running at a very similar speed the range in max G loading is massive – from 2.5G for Goucher to 3.7G for Mosop, with the majority clustered around 3G. Given this wide range I would suggest that time on stance/time in air might not be that critical to running performance at marathon distances and beyond. I would generally agree that short time on stance might be expected to provide greater energy return from elastic recoil, however, at these longer distances other factors are equally if not more important – producing the high loads required for a short time on stance is not free and likely to result in higher fatigue. For ultra distances I would expect the higher time on stance to become more advantageous as muscle fatigue becomes a more pressing issue to manage. I would guess that different levels of fitness would also move the optimum balance of time in air vs time on stance – also as muscle fatigue grows during a run again the optimum is likely to vary for us to get the best out of our overall system. Elites run a marathon at a pace just below anaerobic threshold, but anaerobic threshold is a gradual transition. Even a small increase in the proportion of energy derived from glycolysis leads to a relatively large loss of fuel efficiency. Therefore, in my opinion, unless you have very poor running mechanics, maximising aerobic fitness is generally more important than trying to adjust running mechanics when preparing for a marathon. The next factor after metabolism is cadence. Although computation of optimum cadence is impossible without knowledge of the elastic properties of tendons and muscles, empirically, the evidence suggests that efficiency increases with increasing cadence up to around 190 steps/min. It is noteworthy that Mutai the eventual winner by a hairs-breadth from Mosop also had a slightly greater cadence than Mosop (188.5 v 185.6) while third-placed Gebremariam had a cadence of 177.4; and Hall, who finished fourth had a cadence of 173.9. However it is also probable that optimum cadence for the individual depends on height, weight and leg strength. I am light in weight, short in stature, and suffer from the muscle atrophy that afflicts the elderly. My optimum cadence appears to be over 200. Proportion of time spent airborne is the next factor. Here Mutai is the exception with a proportion of only 0.441 which is scarcely greater than Hall (0.440). For Mosop, Gebremariam and Hall, proportion of time airborne does in fact correspond to finishing order, though I suspect that in most situations, proportion of time airborne after 25K is largely a reflection of how tired the runner is. As runners tire in a marathon, proportion of airborne time usually falls off more markedly than cadence. In the case of the women, the three who finished within a hairsbreadth of each other (separated in total by 6 seconds) had very similar proportion of time airborne, while Goucher, who finished over two minutes behind the other three, has a substantially lower proportion of time airborne. However, in contrast, Goucher’s cadence was in fact second fastest, consistent my view that mechanics is usually less important than metabolism when running a marathon. The really important thing for the marathon runner is being fit enough to keep glycolysis to a minimum. Thanks for providing some details about your computations. With regard to the vertical component of velocity, we have both done the calculation in essentially the same way. For the horizontal component of velocity, we have both had to make additional approximations to get a tractable expression. The assumptions made at this stage in the calculation are potentially crucial in determining the magnitude of the small horizontal deceleration and acceleration that occurs on stance. The magnitude of this small change in horizontal velocity is crucial for answering the question about the direction and magnitude of any angular acceleration on stance. You do not state how you computed angle in your expression F(t) * tan(angle). The computation of tan(angle) would be straightforward if you assume horizontal velocity is constant – which at first sight appears to undermine the point of trying to compute horizontal acceleration. However it would perhaps be acceptable as the first estimate in an iterative procedure. I will look forward to seeing the details of your current computations once you have started your own blog. However, I am inclined to think that the most satisfactory answer to our debate will come from a numerical integration using observed force plate data for vGRF and hGRF. While I appreciate your rationale in wanting to compute the relevant accelerations, velocities and displacements of the COG, and accept this would be the best approach if we had good force plate data, I do not yet see any compelling reason to abandon my alternative approximate model based on computing the effect of the component of gravity acting at right angles to the line joining the point of support to the COG. I will happily abandon that approximate model if good force plate demonstrates that there is no head-forward-and-down rotational acceleration in late stance. As I have maintained all along, rotational acceleration of the line joining point of support to the COG has a trivial impact on running mechanics. My main reason for invoking it at all was to illustrate that gravitational torque does not provide net horizontal propulsive force, contrary to Pose theory. However this conclusion does not depend on any approximate model. It follows from the laws of conservation of angular momentum and linear momentum. We agree on this. It is not even necessary to invoke rotational effects to account for the observation that runners land with point of support at least slightly in front of the COG. This observation can be accounted for less controversially by noting that if time on stance is non-zero, the forward acceleration produced by hGRF in late stance must be balanced by a braking effect in the early stance, when running at constant mean velocity, in the absence of wind resistance. We are the same page w.r.t the issues of analysis the horizontal acceleration. For my analysis I’ve assumed that the change in horizontal velecity is small w.r.t to magnitude of the horizontal velocity so that one assume that the hGRF = vGRF*tan(angle). For a first order analysis by hand I feel this is OK, and for only the case of a long time on stance (the 2G case) does the deceleration prior to mid stance get something I’d worry about the assumption causing too large errors. As you mention an numerical integration of the forces would be the easiest way to resolve this – I did try to convey this in an earlier post as well. > While I appreciate your rationale in wanting to compute the relevant accelerations, velocities and displacements of the COG, and accept this would be the best approach if we had good force plate data, I do not yet see any compelling reason to abandon my alternative approximate model based on computing the effect of the component of gravity acting at right angles to the line joining the point of support to the COG. Oh dear, oh dear, oh dear. I had hoped the penny will have dropped by now, and the by deriving the maths for the linear analysis would have pointed out the glaring errors in your angular analysis. I must admit to being puzzled at how rationally you’ve grasped the linear analysis, including the awkward parts to it, but have been blind to how the maths is so different your previous angular analysis and yet not seen that this is down to the later analysis being wrong. Your error, as I’ve pointed out many times, is that you angular analysis *completely* ignores the effect of radial velocity and radial accelerations have on the angular velocity. You simply can’t assume that the distance between the center of mass and the foot doesn’t vary on stance, the errors in doing this are far greater than any of the other accelerations that you have calculated. If you do the analysis correctly you’d get exactly the same results as the linear analysis, but you… don’t do you, not even close. According to your angular analysis you decelerate due to gravity, but… gravity is vertical force and can only accelerate you vertically, the linear analysis is very clear – its’ the horizontal GRF which is responsible for the reduction in horizontal velocity, gravity takes no part. The linear analysis also tells us that the angular velocity increases to mid-stance, completely in opposition to your results. I do not think you have reason to be dismayed. As I have remarked several times, we are in agreement on all except the most trivial of issues. I am reluctant to spend too much time on the trivial differences, but because the issue of ‘gravitational torque’ has achieved something of a cult status among some popular theorists on running mechanics, I think it is worth clarifying the issue as much as possible. If we are to achieve any clarity, it is necessary to start by defining terms, so let me once again explain what I mean by the term. By gravitational torque, I mean the product of the force of gravity by the horizontal displacement of the COG from the point of support. (I appreciate that you might not like the label ’gravitational torque’ for this product. I do not mind if you give it some other name, but before leaping to judgement, consider the implications of defining this product). Throughout the gait cycle, gravity exerts a constant downwards force that in effect acts through the COG, while the point of support remains approximately fixed. When the COG is behind the point of support, the effect of the downwards pull of gravity can reasonably be described as tending to cause the line joining the point of support to COG to rotate in a head back direction, while the opposite situation applies when the COG is in front of the point of support. Of course, other forces act on the body and when these are taken into account it is quite possible that the line from support to COG does not actually decelerate in early stance, nor accelerate in a head-forward direction in late stance. Furthermore, in estimating the observable effect on the body, one also needs to bear in mind that the body is not rigid. Nonetheless, the body does offer substantial resistance to deformation, so the effects that would apply to a rigid body are not completely absent. You report that for the pogo stick model, the head-forward rotation increases throughout the first half of stance and decreases throughout the second half of stance. I have no reason to doubt your maths, though even you acknowledge that you had to make some approximations during your calculations, and therefore it is likely that your results are only approximate. Nonetheless, I am quite happy to accept that what you report is fairly near to what you would have concluded if you had used a computer to do more precise calculations for the pogo stick model. However, let us consider the real situation depicted in the force plate data of Cavanagh and LaFortune, which I have discussed several times in my blog. These data show that after the foot contacts the ground, the backwards directed horizontal GRF initially rises rapidly and then falls to approximately zero quite early in the first half of stance before rising again to its peak value. After the peak, it falls and reverses in direction around mid-stance (as illustrated in figure 1 in the above post). Meanwhile vertical GRF rises sharply to an initial minor peak before continuing to rise to a maximum around mid-stance. Let is consider the brief time period early in the first half of stance when hGRF has fallen to approximately zero after its initial rise. At that time, there are two appreciable forces acting on the body. Gravity acting vertically down through the COG and vGRF acting vertically up through the point of support. Since the COG is not directly above the point of support at this time, the lines of action of these two forces are displaced horizontally. If the body were rigid, the net effect would be a deceleration of the forwards rotation of the line joining point of support to COG. As the body is not completely rigid the actual effect is more complex. However to the extent that the body offers substantial resistance to deformation, I think that in practice it is possible that some deceleration occurs at this time. Thus, guided by real data, my initial inclination had been to think that after the initial rapid acceleration of rotation in the head forwards direction there would be a small decrease in the velocity of this rotation, under the influence of ‘gravitational torque’. However, I am quite happy to accept that for a runner landing on the forefoot with fairly ‘soft knee’, the GRF curves might resemble the pogo stick model more closely than the Cavanagh and LaFortune data. So I think that the minor perturbation of the head-forward rotational motion that occurs during stance will be best answered by examining real data rather than speculating about models. However, whatever minor variations in rotational velocity might occur during stance, if angular momentum is to be conserved the net acceleration over the entire gait cycle must be zero. Therefore, whatever the answer regarding the accelerations and decelerations while on stance, it will not change the most important conclusion on which we both agree: gravitational torque provides no net forward propulsion when running at constant velocity in the absence of wind resistance. > I do not think you have reason to be dismayed. But yet again you demonstrate that you absolutely don’t get it, you are still trying to explain to me about this interpretation of ‘gravitational torque’. It’s pointless trying to tell me about something that is entirely bogus, it may have obtained a mythical status in trying to explain running mechanics but it’s only because those writing about it in such a way have absolutely no clue about mechanics, or how to analysis it. No, this is bogus, this isn’t the case at all. This mistaken belief comes from trying to analysis the effect of gravity as only a moment about a fixed radius. The radius isn’t fixed, it’s reducing at the point of landing, and only gets to zero when you are at mid stance and the fall is arrested. This reduction is radius is critical as it when doing a angular analysis one has to take in account the Coriolis and centrifugal “forces”. I say “forces” as this are really just fictional forces used to as corrections for an angular analysis, they don’t really exist, they only exist because of the type of analysis. Think about the point of landing, with your ‘gravitational torque’ analysis the moment is greatest when you are furthest back and just touching down. At this point the hHRF and vGRF are zero. So right at the point of touchdown we aren’t be slowed down at all yet. However, does this correlate with your ”gravitational torque’ analysis? Not one bit, here you have the point of greatest deceleration, yet the proper linear analysis has none whatso ever. You can only square the books by adding in all the extra terms required for an angular analysis. You have never tried to add these terms in, you ignore it completely yet never bother to explain how why it’s possible to do so. The extra terms are are complex and unintuitive, and is probably why it’s so overlooked by those who don’t understand mechanics. However, ignoring them isn’t just a small error, it’s result in *completely* the wrong analysis, results and conclusions. This isn’t a subtle point of disagreement, it’s fundamental. All those trying to use ‘gravitational torque’ neither understand what ‘gravitational torque’ really is, and don’t understand angular mechanics and what it entails. All the stuff written by the Pose advocates doesn’t just ignore the reality the fact that all runners land in front of the COG, the whole analysis is totally flawed as well. The analysis is bogus, and your rebuttal using the same style of maths is just as bogus. Two wrongs don’t make a right when it comes to analysis. I am not convinced by your rejection of the statement: ‘When the COG is behind the point of support, the effect of the downwards pull of gravity can reasonably be described as tending to cause the line joining the point of support to COG to rotate in a head back direction’. The fact that the body is not perfectly rigid does not rule out rotational acceleration. Nor does coexisting horizontal linear motion. Nonetheless, I am completely happy to accept that the effects of other forces, and the effects of deformation of the body make the picture quite complex. I am intrigued about your statement regarding the involvement of Coriolis force. As you know, this is a virtual force whose effects are perceived by an observer in a rotating frame of reference. We have been discussing rotations perceived by an observer standing still on the surface of the earth. The effect of rotation of the earth would produce a negligible Coriolis effect when observing something the size of a runner. The question of whether or not you regard our differences as fundamental is of course for you to decide. However I am grateful to you for an interesting discussion, which has made me think more deeply about the consequences of deformability of the body. I think that if there is any period in the first half of stance in which there is an actual slowing of the rotation, then this effect would be small even in a heel striker with a stiff knee. Oh dear. Do I have provide a full mechanics course within a blogs comments? For angular mechanics, Coriolis has an effect anytime you have a radial velocity, if the velocity is inwards then you get an angular acceleration. When you land you have a radial velocity *so* you get an angular acceleration from this. If you resolve gravity relative to the radial vector you’ll get a radial acceleration component and an angular acceleration component. The radial acceleration creates a radial velocity which in term creates an angular acceleration. These factors aren’t tiny like in effect of Coriolis on earth. Please go read up about Coriolis to understand this. Later on I’ll have a bash at explaining just how crazy the upside down pendulum model is for analysis running gait. The Coriolis effect is observed by an observer located on a rotating frame of reference. Our observer is stationary on the surface of on earth, which for practical purposes when considering a human runner, can be regarded as an inertial frame. Perhaps I should not have thrown you a curve ball by drawing attention to the fact that the earth cannot be considered an inertial frame when considering large scale effects. Coriolis is really about keeping the rotating reference frame consistent with linear moment and velocities. In 2D rotating frame you have angular and redial velocity and acceleration and to match these with the linear velocity and accelerations you have to introduce corrections. The easiest way I find to think about it to think about a stone on a string rotate at 1m from the center with a linear speed of 1m/s, it’s angular velocity is 1 rad/s. Now if you pulled the stone in towards the center so it’s radius is now just 0.5m, for conservation of energy and momentum we know that linear speed will still be 1m/s, but the angular velocity for to achieve this velocity will now be 2 rad/s. If you do all your maths from rotating reference frame then you need to account for how reducing the radius creates an angular acceleration. This is Coriolis. Often Coriolis gets talked about in the context of large scale movements such as weather systems, but alas this makes it easy to think that it’s only applicable to really large motions when this isn’t the case, it’s only when the radial velocity is small relative to the radius that the term is small. The Coriolis term required for your angular analysis isn’t negligible – the radial velocity is significant relative to the radius so has to be taken into account if you want to an angular analysis. To understand more easily have a think about stone on the string and how this maps to the runner on stance and your angular analysis. If the radial distance reduces by 10% then the angular speed to match a constant linear speed will have to go up by 10%. I can’t help but feel that you’ve happily discarded terms because you’ve convinced yourself they aren’t applicable, since these terms complicate things and aren’t easy to understand it’s convenient to ignore them. Alas this isn’t good science. Lets first assume that the upside down pendulum is applicable and describes the motion of the runner on stance well. This model is tempting at it means that we can assume that the radius is constant and with that the motion of the runner is straight forward circular arc. Maths for a circular arc are well understood and also the mechanics for a circular arc are straight forward as well as radial velocity and radial is 0 so we can safely ignore any Coriolis terms. In mechanics is we know the path and the velocities along that path we can compute the forces. So from this we can now estimate the forces required for the runner to land begin the circular arc through to mid-stance and them to toe off. So what are the forces? We the runner on landing has a horizontal and a vertical components to their motion, but to start following the arc they have to instantaneously change direction to follow the arc. This instantaneously change in direction requires an infinitely large force over an infinitely small time. I don’t ever recall any labs reproducing such infinitely large impact forces but for our model to valid they must be occurring, perhaps it’s simply that the labs don’t have equipment sufficiently accurate to pick up such large forces applied over an infinitely small amount of time. Lets stick with the model for a little longer, the simplicity of the analysis is just to compelling to give up on it now. So we now have our runner following the arc, his body is affected by gravity that is pulling him down and centrifugal forces that are pulling him outwards for the point of rotation. The total GRF that the leg needs to produce will be the sum of gravity resolved down the leg minus the centrifugal forces, so for our model to be correct we should expect the GRF on stance to be less than 1G, expect for the landing where it’s infinite, and also on toe off where we also need the infinite force as we have an similar instantaneous change of direction. Like misshaped W with the sides infinitely high and narrow and the central section curving up quickly to be just under 1G between landing and toe off. Now the GRFs recorded in the labs are more link an little sin curve, but hey, our model is still so compelling simple we can ignore this little discrepancy. Another mis-fit with typical observations of runner gait is that the idea that the path of the runner on stance goes from high on landing, to lowest at mid-stance and then highest on toe off. This curve is pretty well the mirror image of circular arc present in the upside down pendulum model. Do you think it’s kinda odd that observations of runners in real-world, whether it’s paths or forces always disagrees with the pendulum model. It’s either that observation that is wrong or the model. Which is it to be? Take your choice, pseudo science or science. I agree that an inverted pendulum model along the lines you present doesn’t make much sense. If the goal is to produce an informative model that allows an analysis of the entire gait cycle, I think you would be better off refining the pogo stick model. I have not ever attempted a full mathematical analysis of a model of the entire gait cycle. I have presented various calculations intended to illustrate specific aspect of the cycle. I did once briefly consider doing an analysis of the pogo stick model, but I never actually completed the full analysis of the vertical and horizontal velocities and accelerations of the entire cycle, mainly because of the intractability of estimating hGRF precisely. I was therefore interested to hear that your analysis of the full cycle required nine pages of computations, even after you had taken a short cut to avoid the intractable problem of precise estimation of hGRF. At this stage I would be very interested to see the details of your computations. So it would be good if you created a blog site and presented the details. It would also be interesting to see a computation of the velocities and accelerations based on empirically observed hGRF and vGRF data, but in the first instance I would be delighted to see the details of the model in which you assume that vGRF has a simple sinusoidal form. So I look forward to reading your blog. I provided most of the key bits of maths from my analysis in my comments above. The complete lack of explanation of the derivation and diagrams is rather a problem for following though! Writing a blog entry discussing this is long overdue, but alas I still have lots of other pending work to complete before I can allow myself to dive in an do this. I’d value your feedback on my article as I’m developing, could I email it you? One thing I’m curious about when writing up a analysis of mechanics of running is that unavoidable that it’ll contradict the ideas behind Pose Running and Chi Running. This puts me in the path of the faithful, and rather expect Ad Hominem attacks, as I’ve experienced before. It doesn’t bother me too much personally as I believe it rather shows the weakness of argument, however, these types of attempts to shout down contrary views rather detract from key points of the debate. I therefore think I’ve got to make my writing easily understandable, and make it easy to see why other approaches are flawed so it helps readers let go or heart felt beliefs. I’m not a skilled writer so I’m rather at a dis-advantage. I do wonder if I might even have to do a full angular analysis that mirrors the linear analysis to show just what is missing from the over-simplified analysis based on the pendulum models. I can’t help but feel that I’ve arm waved too much is saying that the angular analysis is complicated and unintuitive. My background in engineering and analysis helps me intuitively know what types of analysis are sensible and which ones are horribly complicated. What this discussion has shown that conveying this to others isn’t straight forward, putting trust in someone else judgement isn’t something you can buy – you have to earn. Any thoughts and suggestions at what might work well and what doesn’t would be very welcome. With regard to how you might persuade advocates of the theory that gravitation torque provides forward propulsion when running at constant velocity, I think you should focus on invoking the laws of conservation of linear and angular momentum to demonstrate that any gain in either linear or angular momentum during part of the gait cycle must be balanced by a loss in some other part of the cycle. I think that you might have a harder job convincing people that gravitational torque does not occur in a uniform gravitational field. While the pendulum might not be a satisfactory model of running, it nonetheless does seem to indicate that gravity can produce a change in angular momentum of an object in a uniform gravitational field. At first, I was a little surprised by this, but was prepared to accept that you had done the maths correctly. However, in light of the fact that you will not be able to present the details of your calculations in the near future, I decided to write a computer program to evaluate the accelerations, velocities, and displacements in vertical and horizontal directions exactly, using numerical integration, provided one knows the time course of vGRF and/or hGRF. (The accuracy of the computation is determined by the time increment used in the integration, but calculation errors can be made virtually zero by using a small enough time increment.) In accord with your calculation, under the assumption that vGRF has a sinusoidal form, the rate of increase of the angle between the vertical and the line joining the point of support to the COG decreases during the second half of stance. However, this does not address the question of whether ‘gravitational torque’ has any effect because if you perform the calculation for a body moving over a fixed point at constant velocity, in the absence of gravity, the rate of increase of this angle decreases with time after the body passes the fixed point. However in the absence of gravity, (or in a weaker gravitational field) the deceleration of this rotation is less. Thus gravity does have a relative accelerating effect on this rotation in the second half of stance, but the effect is obscured by the fact that the average horizontal velocity is much greater than the amount by which horizontal velocity increases during the second half of stance. In summary, you are correct to point out that when one takes proper account of all the forces that act, the rate of increase of the angle between the vertical and the line joining from point of support to the COG decreases during the second half of stance, but this is largely an effect of linear horizontal displacement. The effect of gravity is to produce a less rapid angular deceleration that would occur in the absence of gravity. The gravitational torque exerts a relative accelerating influence in the send half of stance, but the effect is extremely small. Furthermore, the opposite effect occurs in the first half of stance. However, I think you are still rather too wedded to the notion of ‘gravitional torque’ having an destinct effect. First up I would suggest dropping the term completely as Gravitional Torque is a well established and understood effect in science with a completely contary effect and scale to the psuedo science usage on the context of running gait. In place of ‘gravitional torque’ might I suggesting using tangential and radial components of gravity as alternative terms. The tangential component of gravity creating a moment if you really want to do a angular analysis. Personally I wouldn’t mix angular analysis terms and linear analysis terms as it’s way too easy to get confused. If you want to do an anglar analysis then you have to account for both the radial and tangential components of gravity. In the linear model these components aren’t ever seperated so you don’t get to see what the individual components do. If we do a angular analysis then we would expect the tangential component of gravity to create a moment that slows down the rotation infront of mid-stance, and increase rotation after mid-stance. However, at the same time the radial component of gravity is pulling the body inwards and this will create an acceleration in the first half of stance prior, but after mid stance inward velocity has been halted so that their is an decceleration of the angular velocity. How much the radial effects have on the maximum speed of rotation at mid-stance is gravity dependent, so the speed up towards mid-stance and the slow down after is also dependent on gravity. So which wins out radial or tangential? Do they balance out? I can’t answer that without out doing an analysis, what I can say for sure it’s obsolutely wrong to only talk about the tangential component of gravity as effecting the angular velocity and to ignore the radial effects. I think we also have to be carefully when drawing conclusions from altering the magnititude of Gravity in a computer model as this will change everything about dynamics of flight and stance. The lower Gravity the short time on stance will be, and the lower the vertical oscilation in flight and on stance will be, so it will result in lower changes in angular velocity due to the horizontal GRF (as this is smaller due to small angles on stance and G loading) and the effect of changes in the radius on accelerating angular velocity towards mid stance. As Gravity goes to zero we’ll find that time on stance goes to zero and we have a completely flight flight path. This is exactly what we should expect as we float off into space, but here the angular velocity on the infinitely small time on stance is constant – it never changes as is simply equal to the velocity/leg length. Continuing the thought experiment, as we increase Gravity the time on stance increases, the angles on stance increase so too does the effect of horizontal GRF, and vertical oscilation increases as well. Horizontal GRF slows angular velocity prior to mid-stance, and speeds it after, while vertical oscilation increases angular velocity to mid-stance and slows it afterwards. So far the analysis suggest that the effects of Gravity on vertical oscilation outweigh the effects of Horizontal GRF – otherwise we would have seen a slowing, which makes me think that the net effect of increasing Gravity will be to the acceleration of the angular velocity towards mid-stance and the slowing of it afterwards. Taking this all together by best guess is that the radial components of Gravity have a stronger effect on angular velocity than the tangential components. Another way to look at the effect of Gravity, is that before mid-stance we are descending with Gravity towards a low point at mid-stance, then after mid-stance we are raising up against Gravity. In terms of exchange of Gravitational Potential Energy we’d expect the velocity due to effect of Gravity to be highest at mid-stance and then after mid-stance as we rise upwards Gravity pulls us back down trying to slow us down, and it’s only our own legs doing work against it that overcomes this. Given this it would rather unexpected to find that the tangential components of Gravity and somehow winning out over the radial effects. Given both these perspectives of the dynamics I would suggest you revist your conclusion that effect of Gravity pre mid-stance is to slow angular velocity and post mid-stance to speed angular velocity. I believe the effect of Gravity to be the exact opposite. My analysis did not omit the radial effect of gravity, and therefore is not subject to the error you suggest. I am surprised you have any radial or tangential components of gravity in your computer model. You would only have these components in a angular analysis which I would have thought you would have avoided as it’s certainly far more complicated to do such an analysis than a linear one in the case of the runner on stance. For a linear analysis the only term that gravity is included in is forces in the vertical axis. For my own analysis the only forces that had a radial aspect was the GRF, this one has to compute the angle from the vertical of the angle between the COM and the foot contact point. From your description of the “effects of Gravity” and “geometrical effects” on your model it sounds like you’ve got something wrong somewhere. Without knowing your maths or reviewing the code I can’t say where it might be, but I’d kinda sounds like your mixing different styles of analysis. I am advice that you draw up the model entirely from a linear perspective. The angular and radial speeds can be computed by just computing the tangential and radial components of the linear velocity vector relative to the ground contact point. In fact I simply included gravity acting vertically in the calculations: this includes both the radial and tangential components. There is no need to enter the radial and tangential components separately. In fact the radial component would not be expected to have any effect on angular momentum about the point of support. However you make me uneasy about your mention of angular momentum as I’m not clear in what context you are using it, I do hope you haven’t figured this into your model. With the basic linear analysis there will be no need to include terms relating to angular momentum, you can simply use a model of point mass at the COM. For the basic first order models I’m expecting us both to discussing you would only need to take into account of angular momentum in a angular analysis. For a more detailed analysis one could start modelling changes in all the limbs, head and the trunk of the body, but to go into this detail requires a far mode complex model and lots more data to control all the boundary conditions all the new variables that we’d add into the model. I’ve re-read your entry about your computer model and I still feel that your conclusions from the results are a bit off. In my reply to this I go into my general expectations of the effect of Gravity on stance and they don’t all fit well with your own conclusions. I don’t think it’s useful to try and keep thinking about the tangential moments on their own or looking for their own specific effects. I think it’s much more productive to just think about Gravity working vertical and this having it’s effect on the path the runner takes through the air and on stance, and how this path in term gives an effective linear and angular acceleration and decelerations through stance. The stronger Gravity is the more the path is deformed from the straight line and the larger the accelerations and decelerations in both linear and angular velocities. As soon as I have time to organise the material in a format that can be easily understood (including appropriate diagrams etc) I will present the computations in the Calculations pages. My main focus in these computations is not on the angular acceleration at all. As I have emphasized ever since I first presented my thoughts on this topic, I think the angular accelerations are small and of trivial consequence for running mechanics. Nonetheless, there is some value in clarifying the effects of gravity on rotation simply because others (especially the advocates of Pose) have proposed these effects are important. Therefore I will include a summary of what the calculations reveal about the rotation effects, but I can confidently say in advance that these effects are of minor importance. Until I have a chance to present these computations in an organized manner, I am afraid that you are shooting in the dark with your criticisms. So I will try to update the Calculations page as soon as possible, and will value your comments at that stage. Great to see that you’ll be writing up your computation and findings. I agree that it’s premature for me to provide a critique on calculations and conclusions. I’ll see if I can coax my printer/scanner into scanning in my workings by hand, if I can get into a pdf I’ll send it along to you. Thanks for sending me a copy of your calculations. I will look at them as soon as possible. Your comment in the accompanying email about the dominant role of cadence in determining vertical oscillation is very interesting, but does not surprise me. For quite a long time I have considered that the most important strategy for triumphing in our dance with the devil is having as high a cadence as possible. I think the most important things to emerge from your calculations and mine are the conclusions regarding the linear velocities and displacements. Nonetheless, I have checked my calculations of angular velocity and I am confident that my calculations confirm your finding that angular velocity decreases in the second half of stance. However, as I noted previously, to determine what effect gravity has on the rotation it is necessary to disentangle the geometric effects that modify the moment of inertia of the body as the legs extend, and thereby change angular velocity without change in angular momentum (similar to the slowing of rotation of a pirouetting ice skater as the arms are extended) from the changes reflecting a change in angular momentum attributable to a putative turning effect of gravity. Although I initially addressed this by comparing with the change in angular rotation expected for a body moving horizontally in the absence of gravity, I do not think this is the best way to do the calculation, as it fails to allow adequately for the effect of radial extension of the body after mid-stance. I think the best way is via an estimation of the change of moment of inertia. This estimate is inevitably approximate in the absence of precise details of the density and trajectory of each volume element in the body. A fairly good estimate might be made by treating each separately articulated part of the body as a geometric solid (eg treating thigh and torso as cylinders etc) but even this calculation would require knowledge of the trajectory of each of the separate body parts. By far the greatest contribution to the change in moment of inertia during the gait cycle will be made by the torso and head because these parts are far from the point of support, they move further from the point of support as the leg extends, and they are heavy. The most difficult calculations are for the thigh and lower leg of the swing leg. At modest paces, in the first 0.1 sec after mid-stance, the thigh is rising and hence will make an increasing contribution to the moment of inertia while the lower leg is descending and will make a decreasing contribution. However because the thigh is heavier, the contribution from the thigh is almost certainly greater than that of the leg, so failure to account for the complex motion of the swing leg is likely to under-estimate the increase in moment of inertia in this period. Therefore I did a calculation based on treating the upper and lower halves of the body as two cylinders, which I think probably makes a conservative under-estimate of the true increase in moment of inertia. This conservative calculation demonstrates an increase in angular momentum of 2.4% in the first 0.1 sec after mid-stance in the case of a runner with height of the COG at mid-stance of 1m and total height 1.8m, travelling at 4 m/sec, and peak vGRF of 2G. Since gravity is the only force that exerts a turning effect about the point of support, I think it is reasonable to attribute this increase in angular momentum in the period after mid-stance to the ‘turning effect’ of gravity pulling downwards on the body while the COG is ahead of the point of support. As we have previously discussed on several occasions, this increase in angular momentum after mid-stance is balanced by an opposite decrease in angular momentum before mid-stance. Because I would be eager to hear you comments on my calculations, I will try to find time to prepare a report in suitable format soon. For the next two weeks I will be busy with two other projects, unrelated to running, but will nonetheless try to complete a report on the main findings regarding the linear velocities and displacements within the next few days. For any patient reader who has followed this extended discussion with Robert, here is an update on the current situation. Robert sent me his calculations and we have subsequently discussed these via email. Robert’s calculations were inaccurate due to the fact that his approach did not allow properly for the effect of horizontal GRF. Nonetheless, my more precise calculations confirmed his conclusion that angular velocity decreases slightly in the second half of stance, at least in the pogo stick model. I expect this is probably also true for real runners on a level surface. This is because extension of the knee and hip produces an elongation of the leg. This slows the speed of rotation in the same way as extending the arms slows the spin of a pirouetting ice-skater. In the case of a vertical skater, there is no change in angular momentum. However, in the case of a runner, whose COG is forward of the point of support in late stance phase, the decrease in angular velocity is less than would be expected due to the change in body geometry resulting from extension of the leg, confirming that gravity does exert a turning effect that increases angular momentum in a head-forward and downwards direction, as proposed in Pose theory. However as I have pointed out many times, this increase in angular momentum does not provide forward propulsion. It is cancelled by an oppositely directed change in angular momentum in the first half of stance. I have added a brief paragraph discussing this in the section on gravitational torque in the page above. As soon as I have the opportunity to prepare some figures illustrating the effects, I will add a page to the Calculations pages. I will report the results of solving the equations that describe the horizontal, vertical and rotational velocity of the body during the gait cycle. While I agree that gravity will tend to produce head forward and down rotation in the second half stance, gravity produces an opposite rotational effect in the first half of stance. In the absence of wind resistance, there two rotational effects are equal and opposite. In the presence of wind resistance air pressure contributes to the head-back rotation , but even in this this situation, the head-back and head-forward rotation must balance, it the runner is to avoid falling over. The knee and calf extensors must simply work harder to counteract the backwards rotation. The article makes no attempt to explain how these two equal and opposite rotational effects contribute to forward propulsion. The next point to notice is that the COM rises during the second half of stance. This is correctly illustrated in the figure. If the COM rises, work must be done against gravity. The article blithely states that this work is done by elastic recoil. This would only be possible if the energy of impact could be captured as elastic energy and recovered with 100% efficiency during recoil. Body tissues do not achieve perfect elastic recoil. Capture of elastic energy actually required muscle tensioning which consumes energy. In addition, even during passive stretching, tendons and ligaments absorb some energy. The available evidence suggests that at most about 50% of impact energy might be captured and re-utilised. The remainder of the required energy must be provided by an active push. In summary, the article contains two substantial errors. First, contrary to the author’s assertion, getting airborne requires an active push. The magnitude of the push is well demonstrated by force plate data. The force plate does not tell us whether this push is provided by active muscle contraction or by elastic recoil. In fact both contribute, but the fact that muscles and tendons are not able to capture and re-use more than about 50% of the impact energy demonstrates that active muscular contraction must provide about half of the required energy. Secondly, in order to prevent the runner falling over, the rotational effect of gravity in the second half of stance counteracts the head backwards rotation induced in the first half of stance, and it is wrong to imply that that this contributes to forward propulsion. With regard to the issue of the so-called extensor paradox, while at least some evidence indicates that extensors are less active in late stance that at other phases of the gait cycle, this does not prove that active contraction is not required to produce the tension required to capture elastic energy. In fact, it would be expected that some, even perhaps most of the tensioning, would occur before mid-stance. There is no paradox. Irrespective of whether the contraction occurs before or after mid-stance, active work must be done via muscle contraction to achieve the push that is demonstrated by the force plate data. Dr Wilkinson may have mixed up two parallel lines of thought because I know from attending Lee Saxby’s courses that he agrees (and teaches) that the elastic action is comprised of 50% muscle action and 50% elastic action (and defines poorer techniques as those that get that ratio wrong). Mick may have meant ‘elastic recoil’ under that definition but neglected to define it thus in the blog (which clearly tries hard to stay brief – a notion I sympathise with but it can bring in limitations in the precision). The BTR blog seems to attempt to make a strong distinction between what is physical facts and what makes a good coaching cue (i.e. an observation about a physical fact may turn into a terrible coaching cue if it forces a different reaction from what we anticipate or interferes with positive reflexes or activates negative reflexes such as the step reflex etc.). Perhaps part of the confusion around this debate revolves around the definition and use of the terms ‘active work’ and ‘active contraction’ and ‘push-off’. it seems to be that the push-off that must occur by this logic is involuntary – a reaction to external forces and thus should be guided by the subconscious mind. This would suggest that we must define ‘active work’ as meaning ‘internal forces are recruited’ (but subconsciously) but that no active focus should be directed towards ‘pushing off’ because such conscious meddling with what should be a subconscious process would be counterproductive. I agree that coaching instructions should be designed to elicit the appropriate action and that conscious focus on muscle contractions that occur automatically can actually interfere with the precise timing of these actions. Despite that fact that some of the principles of Pose are simply wrong (eg the notion of a fall after mid-stance with is contrary to the rise predicted by theory and clearly observable in practice) I have nonetheless examined Pose looking for the possible ways in which the drills and/or the mental instructions might elicit helpful aspects of running style, In fact I believe that Pose drills such as Change of Stance and also mental instruction to Pull off stance both help promote a beneficial short time on stance, whereas encouraging conscious focus on the mechanically correct concept of pushing off stance is likely to encourage undue delay on stance. Overall, I think the Pose mantra of Pose, Fall, Pull is about 66% wrong, I nonetheless think that at least for recreational athletes, it can be a useful mantra. I think that some elites are able to maintain conscious awareness of the mechanically correct sequence of events without letting conscious control interfere with precise timing. There was an informative U-tube clip in which Usain Bolt refers to actively pushing, though unfortunately it is no longer accessible via U-tube. The BTR blog avoids the overt error of the Pose ‘Fall’, but I nonetheless disagree that the head-forward torque in late stance makes a net contribution to forward propulsion. Furthermore the component of force at right angles to the line of action of GRF which generates this torque, arises from an interaction between gravity and GRF, and the fact that this component has a forward directed element is attributable to hGRF. The only forward directed force acting on the body is hGRF. The BTR blog contain some unsound biomechanics, but as with Pose, it might nonetheless provide helpful cues. I am in utter and complete awe at your patience in dealing with the increasing condescension directed your way. I wrote this post at a time when many people had quite an intense emotional involvement in the question of running form. Several gurus had proposed new styles of running (eg Pose, Chi and others) that appeared to offer an almost magical improvement in efficiency and reduction in injury risk. As discussed in some of my later posts (e.g. https://canute1.wordpress.com/2010/02/14/problems-with-pose/) the theory underlying these new styles was flawed. The potentially beneficial aspect of these new approaches was an emphasis on avoiding a conscious push against the ground. Because the timing of the push need to be accurate to within a few milliseconds, for most of us, any attempt to control the push consciously is in fact counter-productive. Hence, at least some recreational athletes derived benefit for Pose. However, due to the flaws in the theory there was a danger of failing to emphasise the need to develop the strength and power that is in fact required to get airborne. To counter this, I deliberately described running as dance with the devil (gravity). Many of my posts elsewhere in this blog have received an anguished critique from Pose enthusiasts, but perhaps contrary to expectation, several of the comments on this particular post have implied that I am too lenient towards Pose. I had started this blog because I wanted to promote debate about these issues at a time when there was intense interest in running form. Therefore I have always welcomed comments, from whatever theoretical standpoint. Over the past decade, much of the heat has gone out of the discussion because I think that there is now a fairly clear understanding of the mechanics of efficient running. Topics such as heel strike v forefoot strike no longer excite such passion. Nonetheless, runners do continue to suffer injury at an alarming rate, and I think we still do not understand enough about how best to prepare our bodies, that have grown to adulthood in an era dominated by automobiles and desks, for the rigours of distance running. Therefore I continue to welcome discussion of running form and training methods.